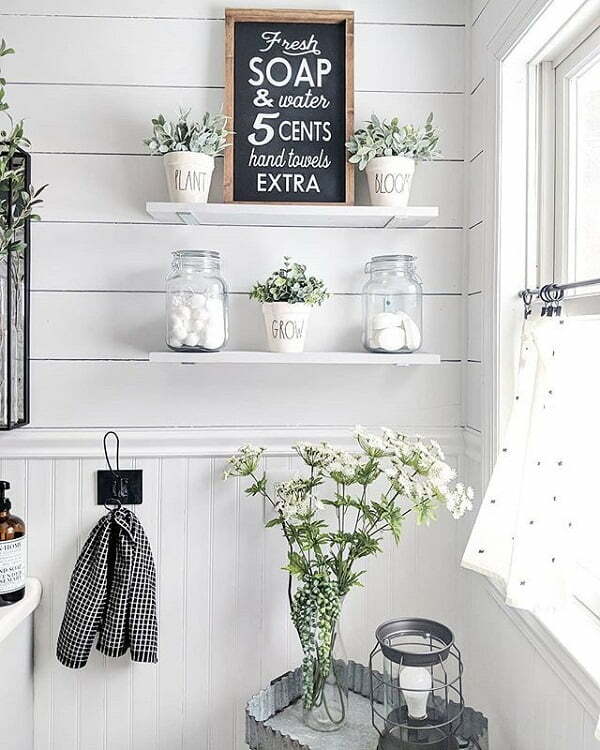 Looking for ideas to add some cozy charm to your farmhouse bathroom? Here’s an epic list of 100 brilliant ideas for your inspiration. 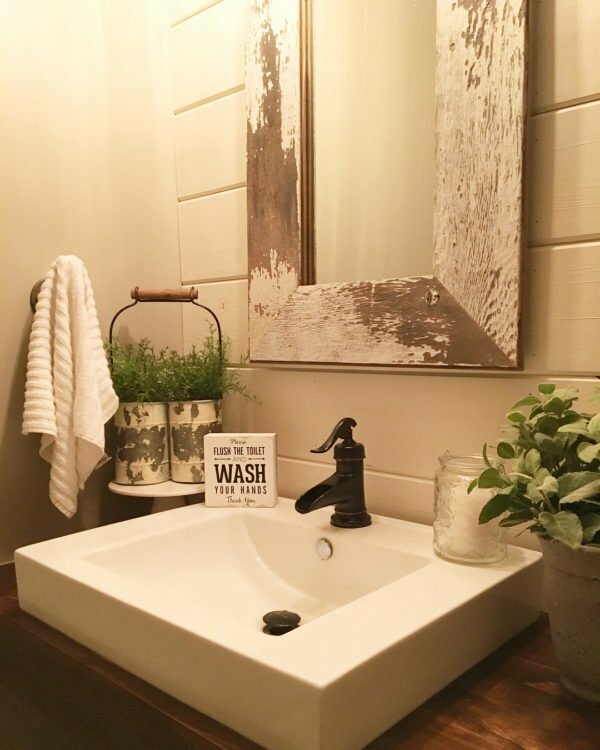 While bathrooms are often the smallest spaces in a home, you can still make a big splash regarding your farmhouse bathroom style. 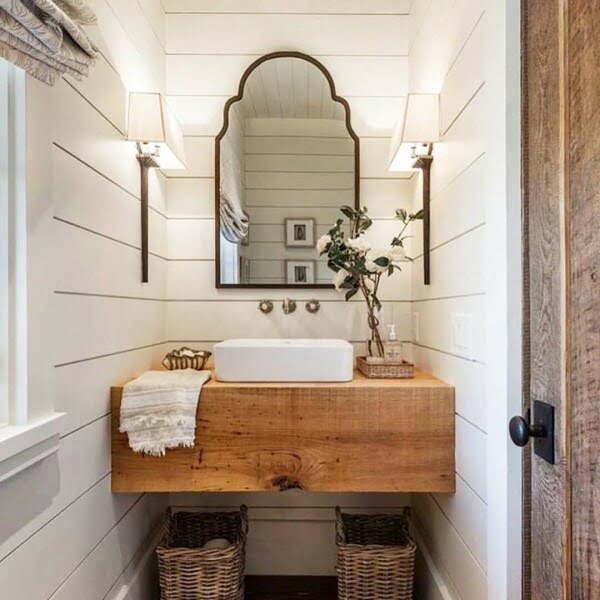 Wall choices like color, paneling, wainscoting or tiles can significantly enhance the small room and turn it into a space everyone will enjoy visiting. 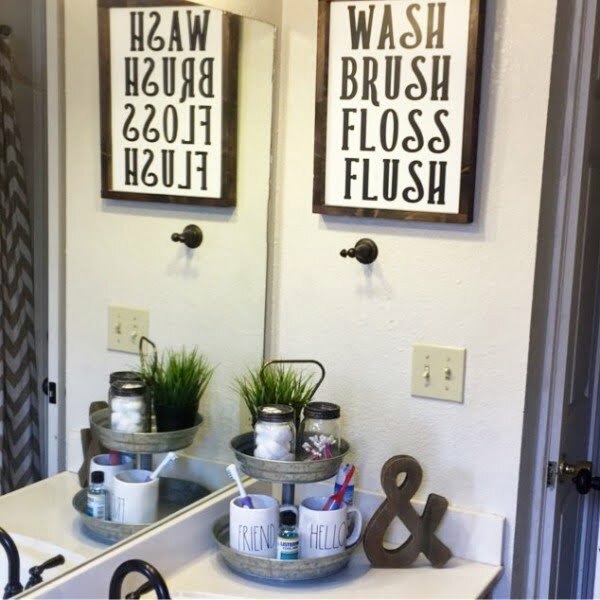 Accessories like wall hooks, towels, bathmats, mirrors, vanities, flooring, shelves, and tubs all synergize to communicate your style. 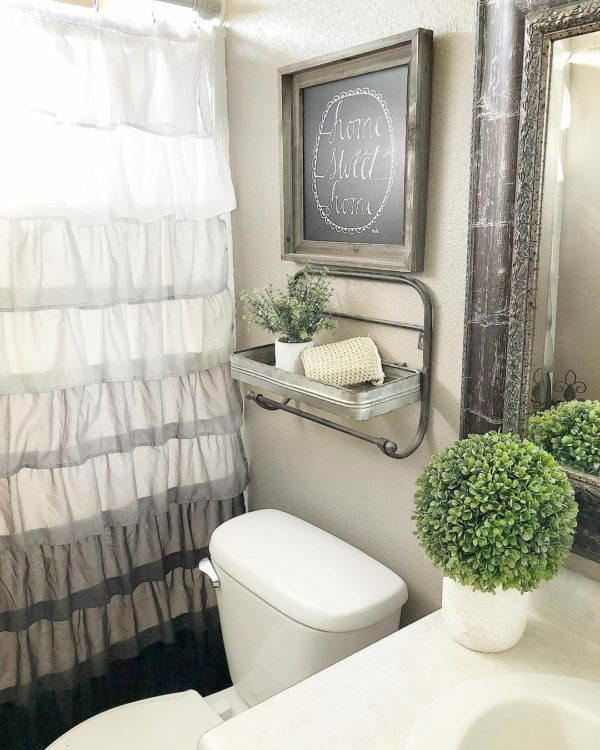 When it comes to cultivating a farmhouse decor style, it can be as simple as adding some vintage-style accessories and weathered-wood pieces. 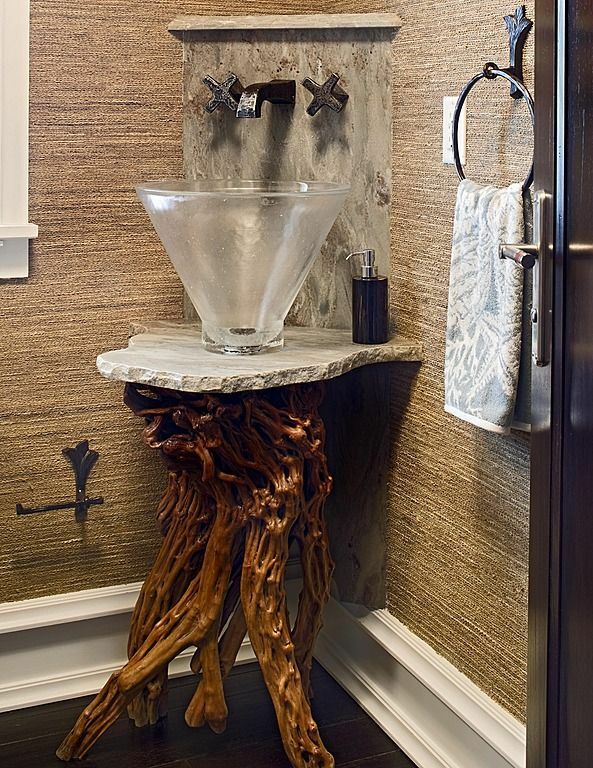 Textures are another great way to add some panache to space, regardless of how small. 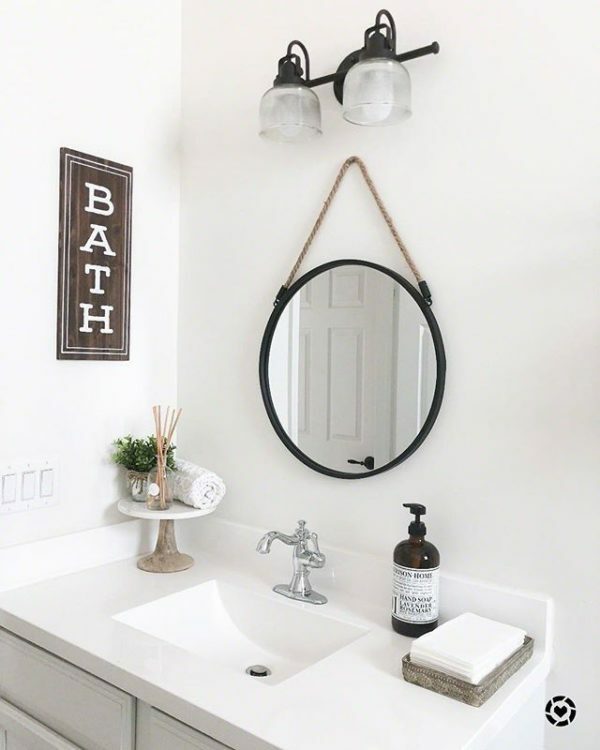 If you are looking to elevate your bathroom decor style, check out the following 100 farmhouse bathroom decor ideas for inspiration. 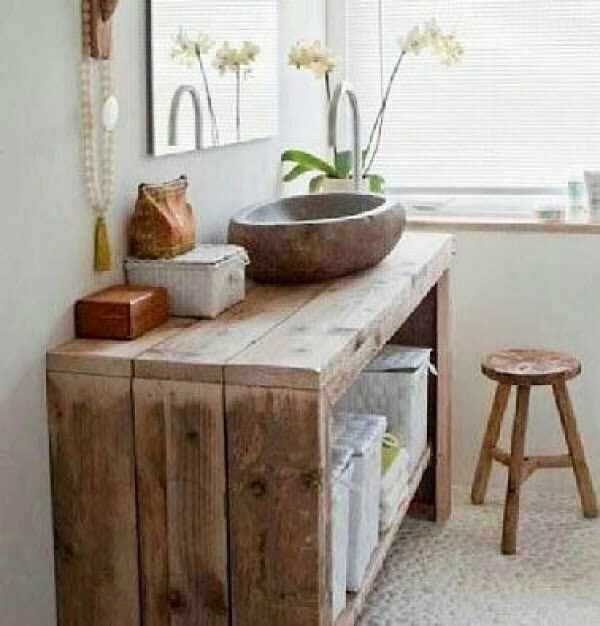 Who says there is no place for furniture in a bathroom? 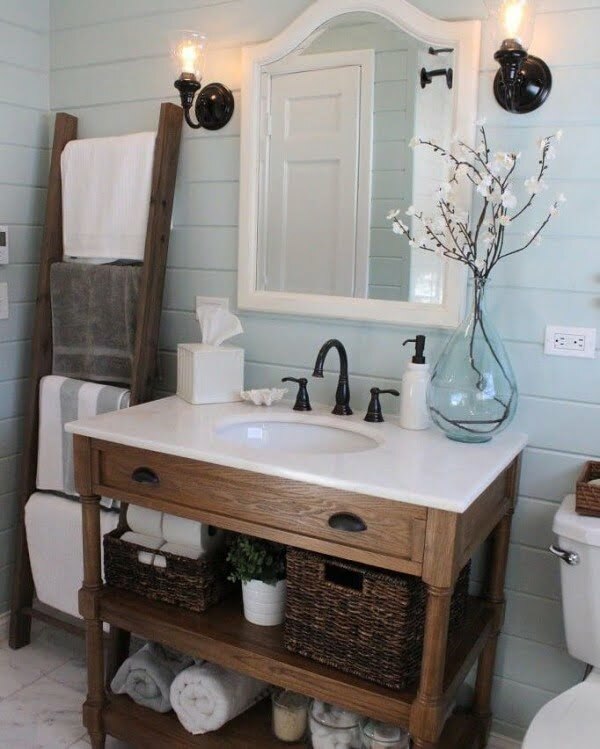 Using a rustic refinished side table as a double farmhouse sink vanity is the ultimate way to bring that vintage rustic vibe into space. Holes can easily be cut out for the sinks, and the unit’s inside is perfect for housing plumbing and storage beneath. 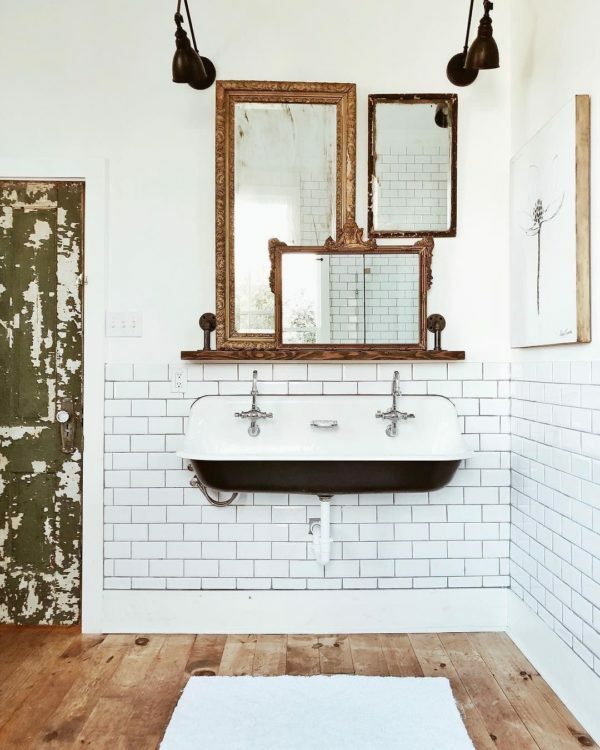 Adding a farmhouse style sink is the ideal way to add some rustic charm, as with a mirror above, it becomes the main focal point wall in the space. 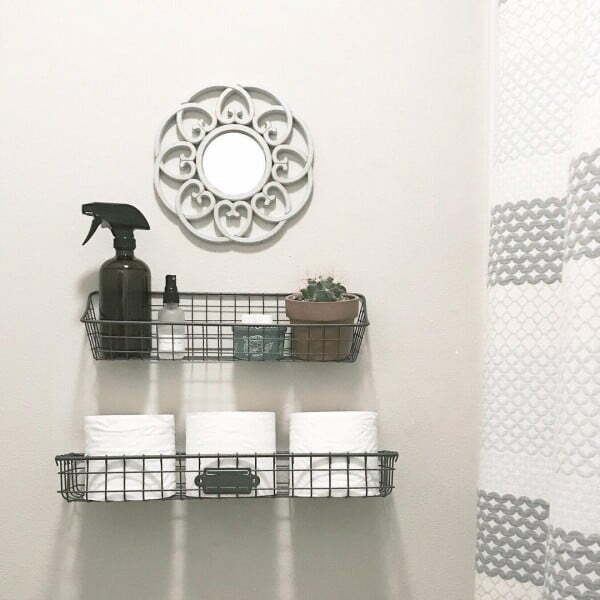 Wire-basket shelving is vintage, farmhouse, and rustic bathroom decor all at the same time. 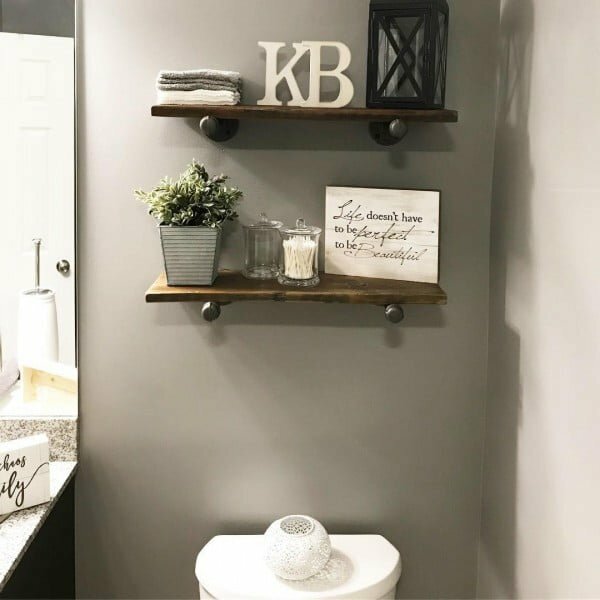 They also make practical additions by providing storage for decor or bathroom items like toiletries, washcloths, and toilet paper. Bath caddies are the ultimate in bath-time luxury. 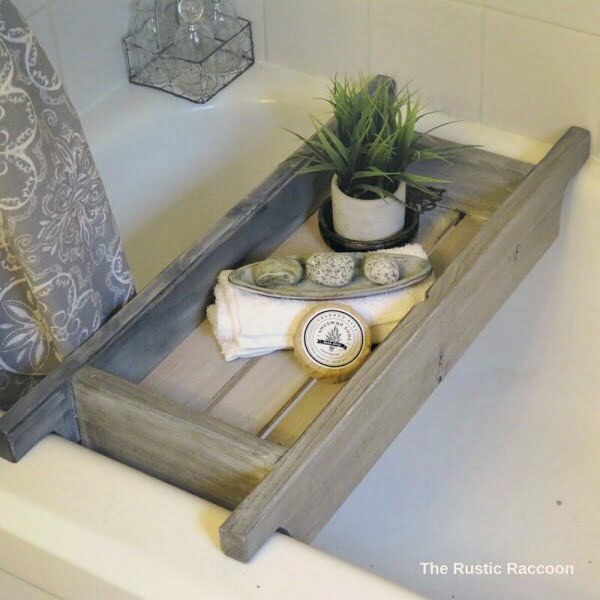 Bathers can enjoy the dry surface space provided while the wooden look charms up space. 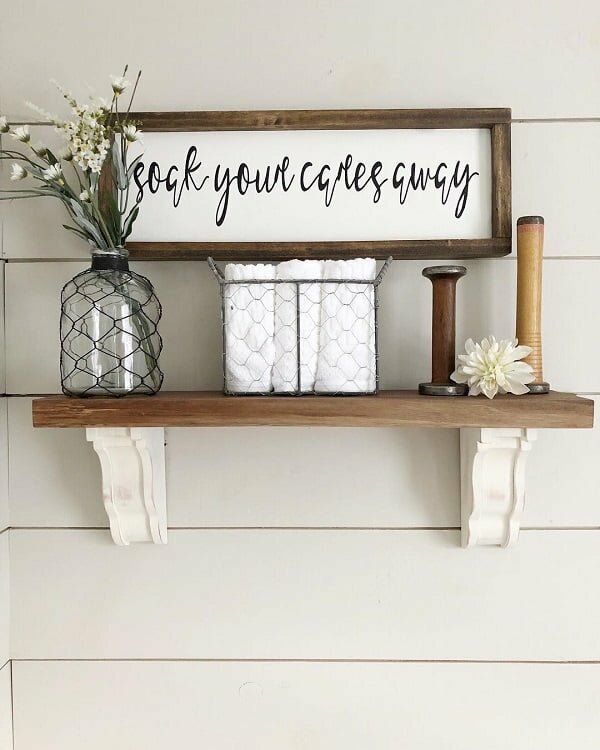 Adding a wall sign to a bathroom adds a splash of graphic fun to space, and the rustic wood frame is warm and charming to behold. Open shelving made from stained wood planks represents the perfect union of form and function. 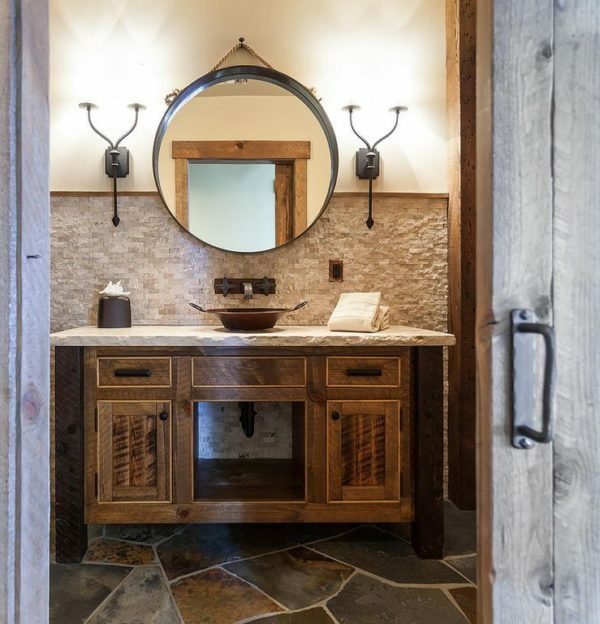 As the wall boasting the sink and mirror is generally the focal point wall of a bathroom, making a big pop with a large-scale mirror framed in rustic wood lends that highly sought-after country feel. 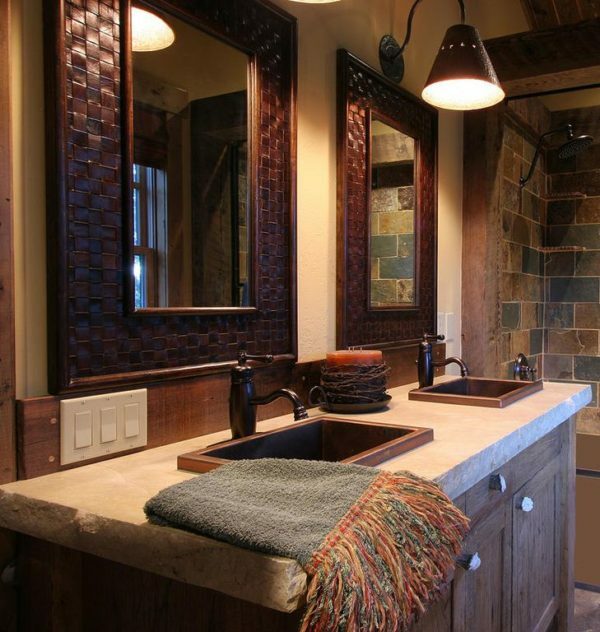 Installing a natural-stone sink is the perfect ode to the outdoors and brings with it that natural and calming mood. 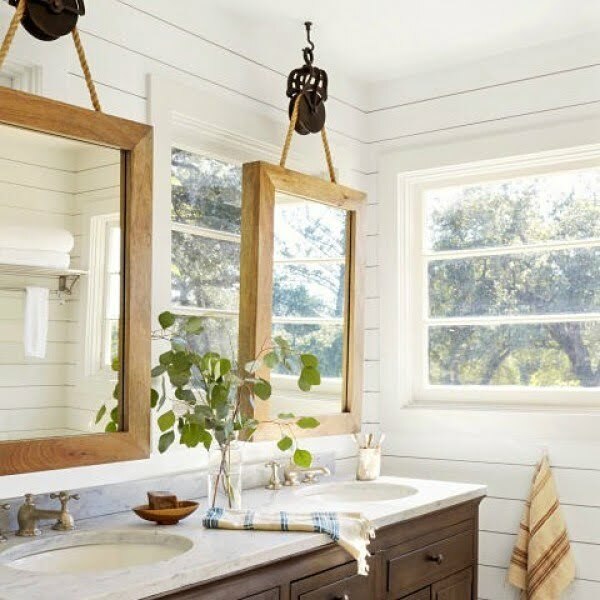 Rather than hanging your mirrors on the bathroom wall in a traditional fashion, why not hang them from pulleys and rope to bring to mind barn-style hardware for the farmhouse feel. 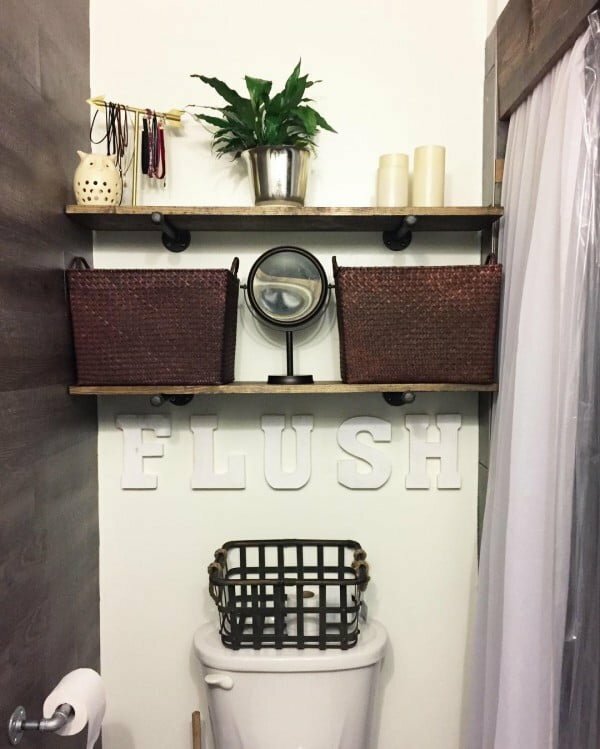 Bringing in some touches of wood, like with a wood stump plant stand and stool, instantly warms up a bathroom by bringing in earthy elements from nature. 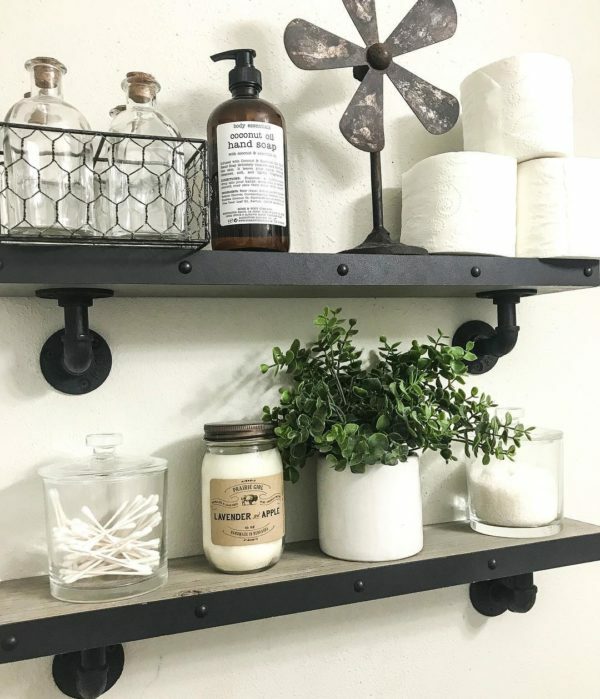 Using basic piping or industrial-style brackets to support wood shelves are simplistic, fun, and functional. 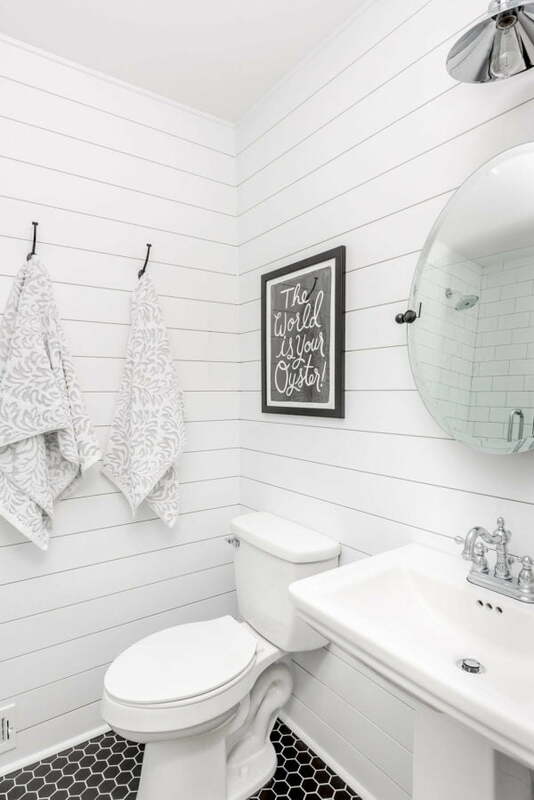 What is cozier and leaves a better impression than shiplap walls? 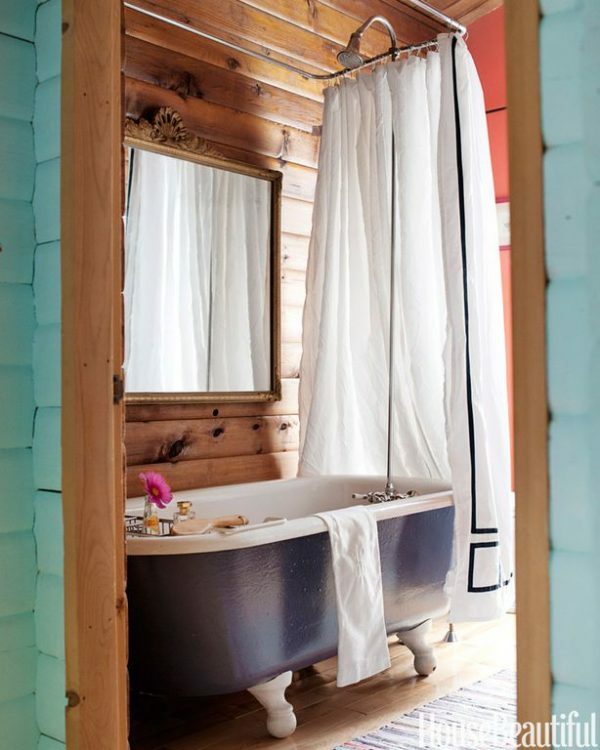 They provide architectural interest and in a bathroom seem the ultimate in cozy cottagey style. 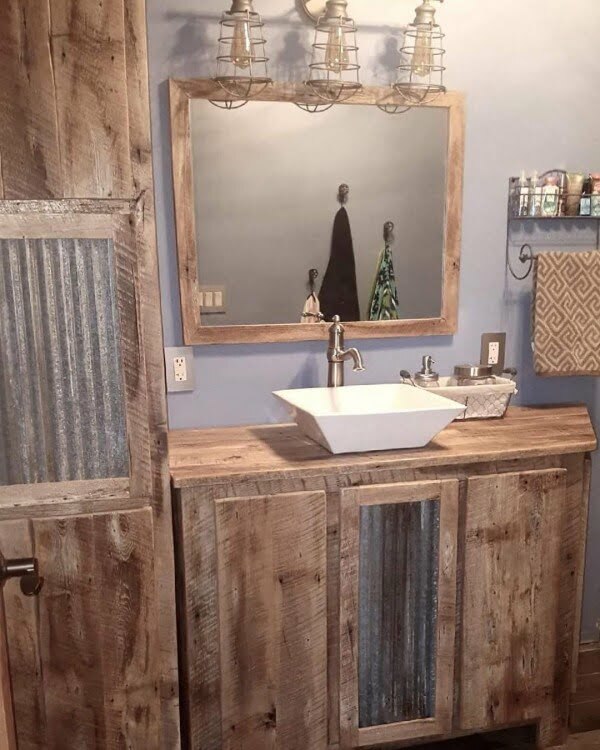 Adding elements of galvanized metal to a vanity and storage unit instantly adds the rustic farmhouse element so many strive for. 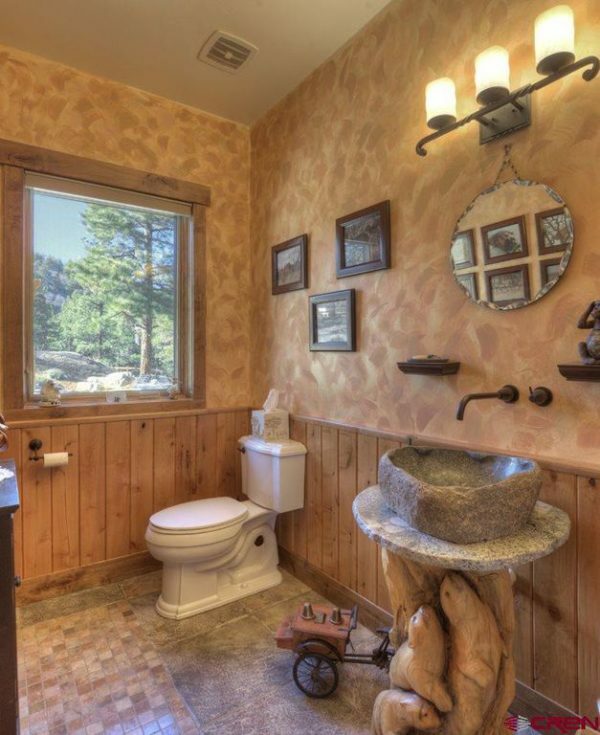 The great thing about pedestal sinks is that you can add unique storage solutions underneath. 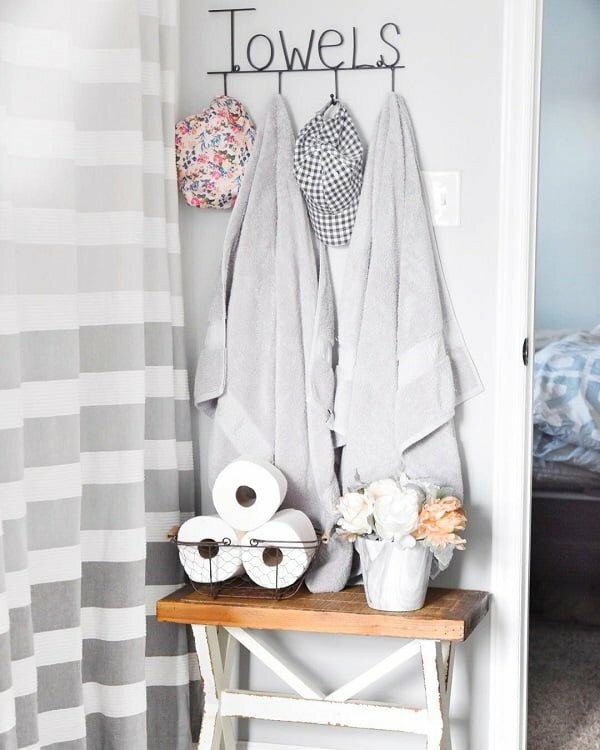 Adding baskets looks as lovely as they are practical and make perfect holders for extra towels or toilet paper rolls. 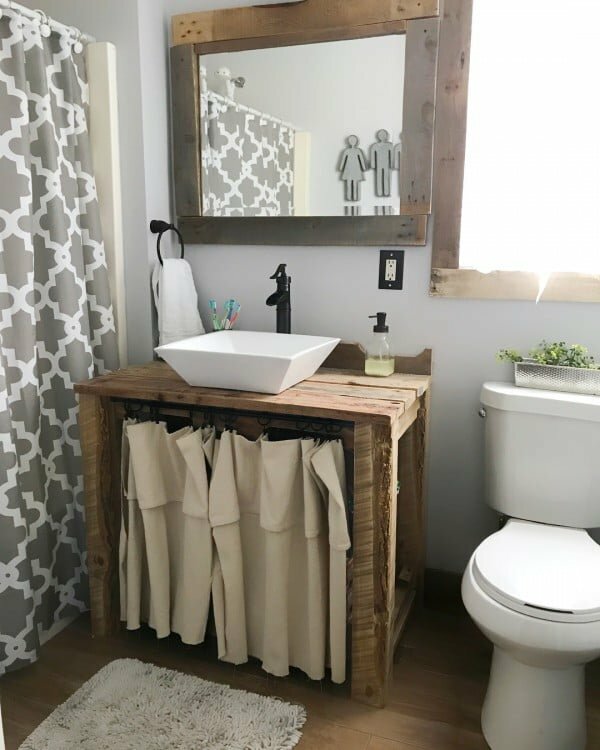 Adding a curtain below a pedestal sink adds a substantial farmhouse-style splash while practically concealing the storage area beneath. 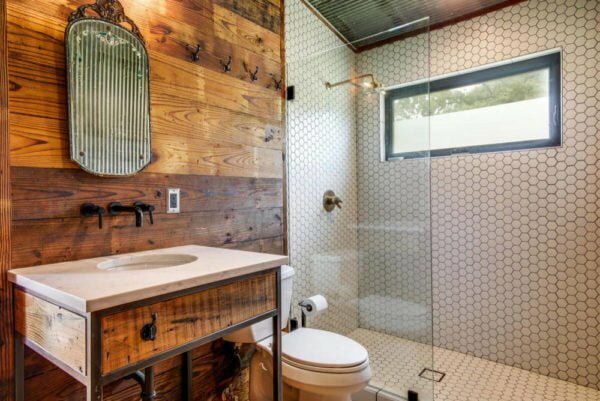 Combining tiles in a bathroom that have textural elements and wood plank tiles adds depth and visual interest to a bathroom. 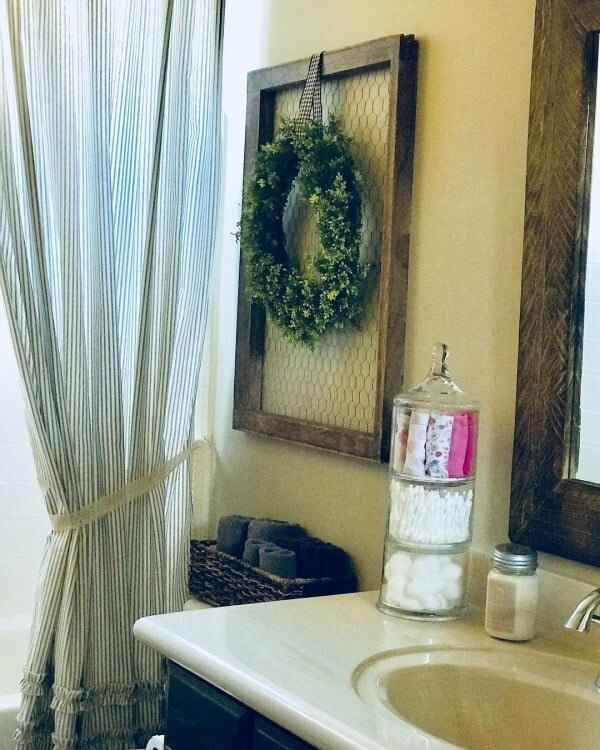 Wreaths are fabulous when it comes to adding a homey, welcoming vibe, and in a bathroom, this is no exception. 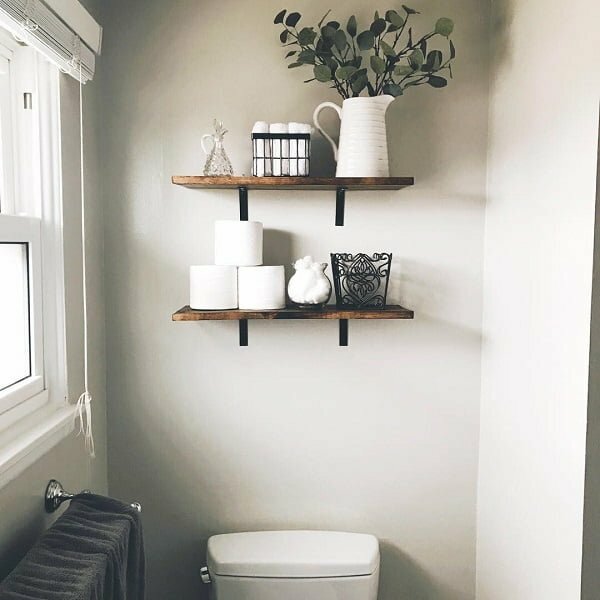 Juxtaposing wood shelves with stone tiles is as rustic as it gets, bringing to mind the natural elements that we find outdoors. 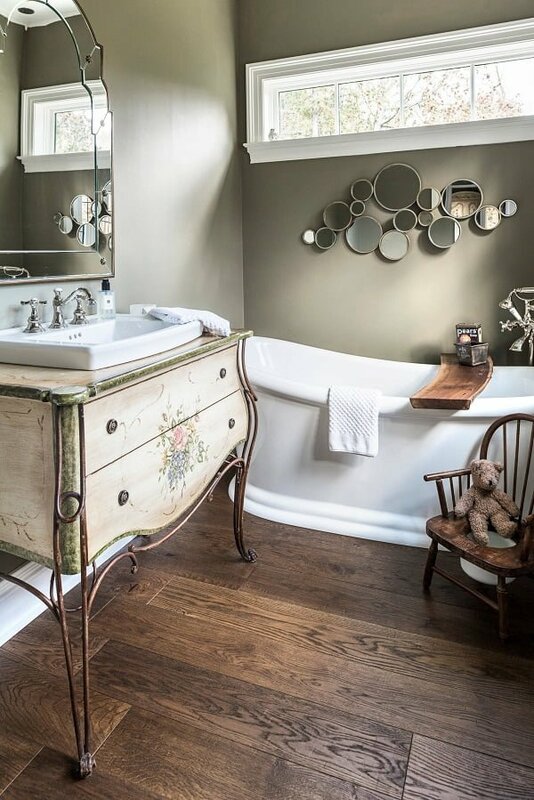 For those wanting to add that vintage bathroom style, a claw foot tub will get you there in a New York minute. 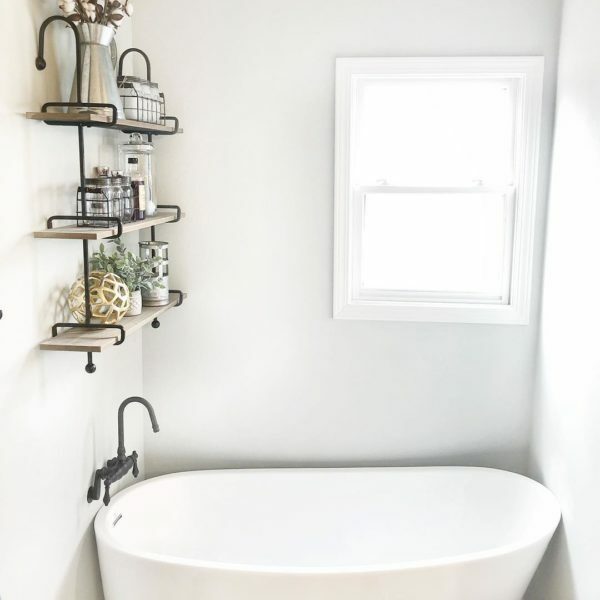 For bathrooms that have the space for a claw foot, users will enjoy the luxury of a larger tub, plus the big aesthetic splash it makes in the area. 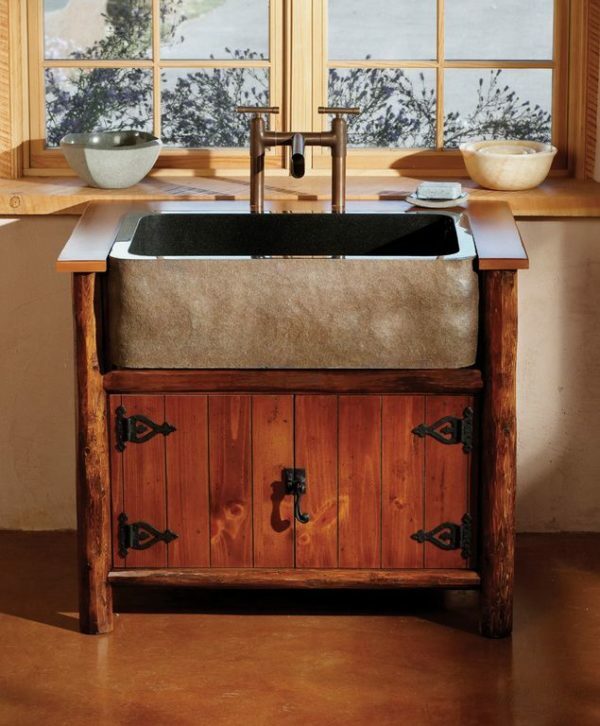 Rustic wood sink vanities are functional and practical. 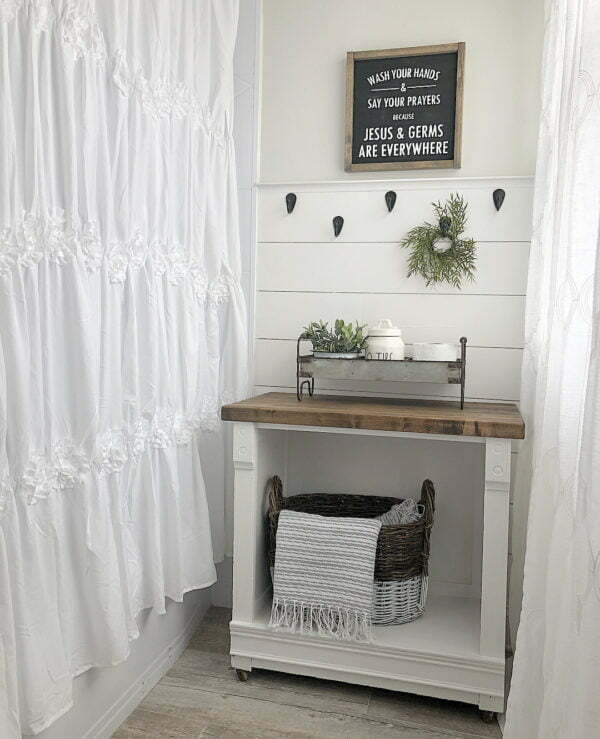 With leaving the front open, storage is easily accessible, while the basket containers beneath add more touches of rustic ambiance. 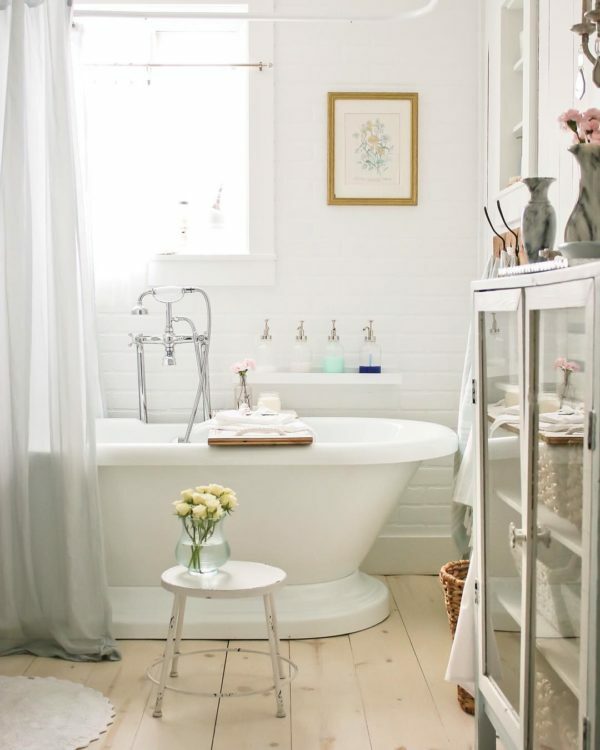 This adorable bathroom is a comfortable blend of neutral shades, boosted with an oriental carpet and lively blooms. Simple, yet divine! 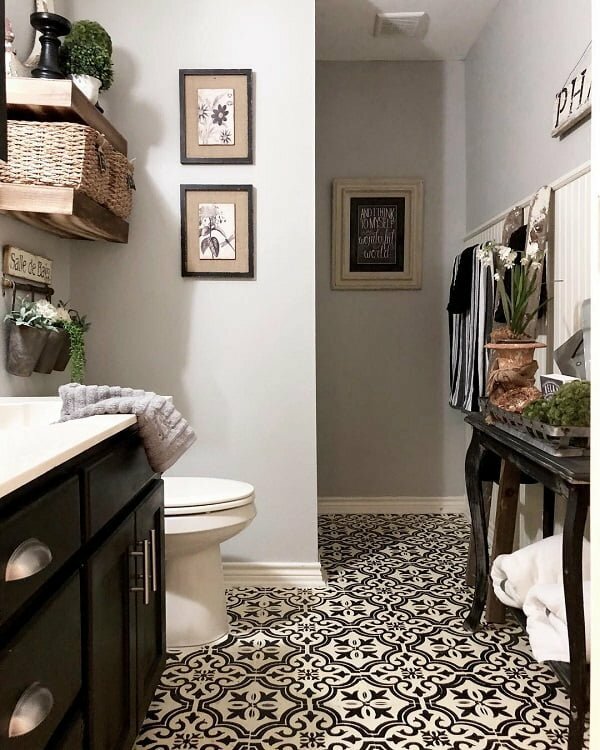 The dark plank ceiling plays well with the navy blue wall, the simplified basin while providing plenty of storage room, too! 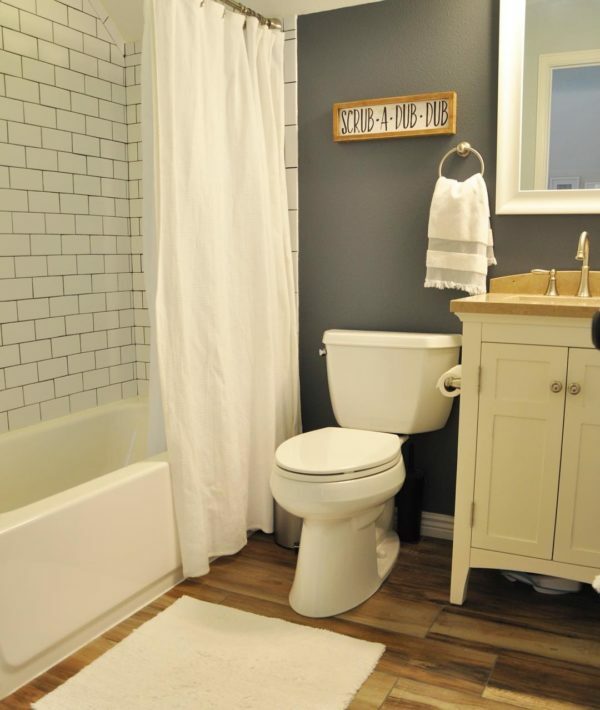 The warm, mellow furnishing tones allow the tile walls to get all attention. And, the castle-y mirror is pretty swag as well. 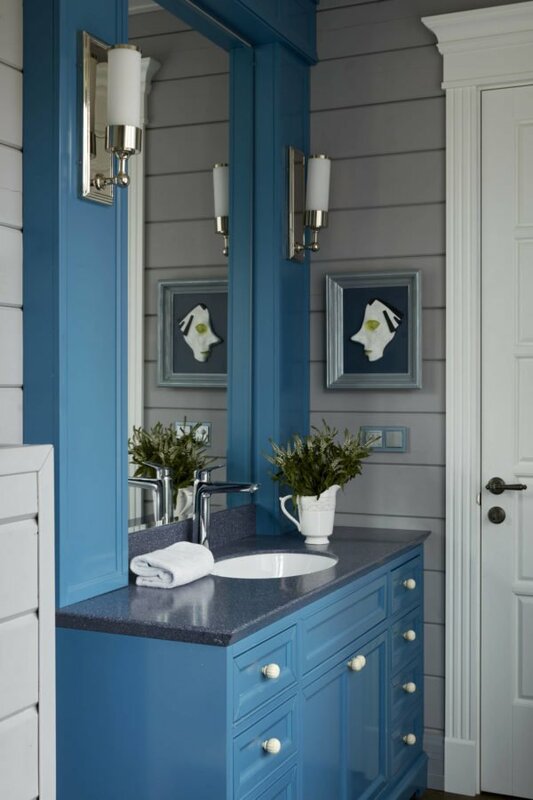 This bathroom uses modern blue decor details and cabinets with marvelously incorporated basin and adorable statement mirror. The bathroom cleverly combines dark-shaded cabinets which accentuate the glass shower and comfortable bathtub, giving the room a feel-good vibe. 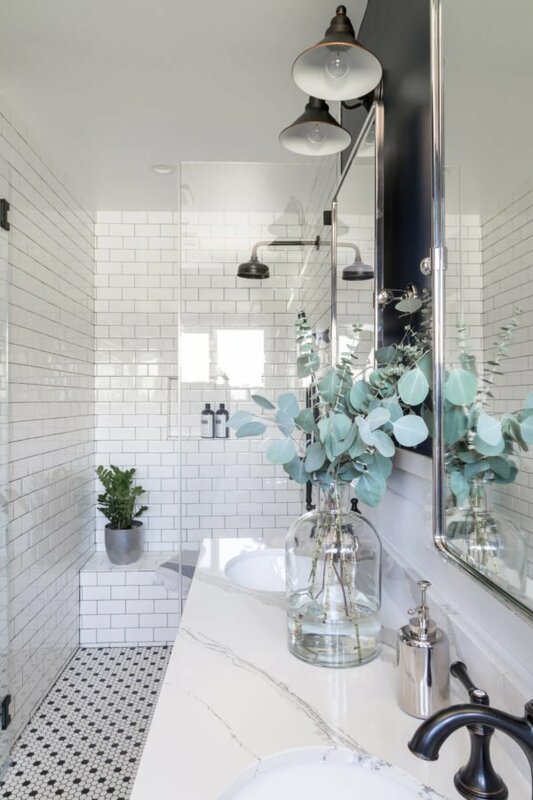 A bathroom which uncovers a very particular sense of taste, matching gray tile flooring, brick walls and black and white patterned showr curtains. 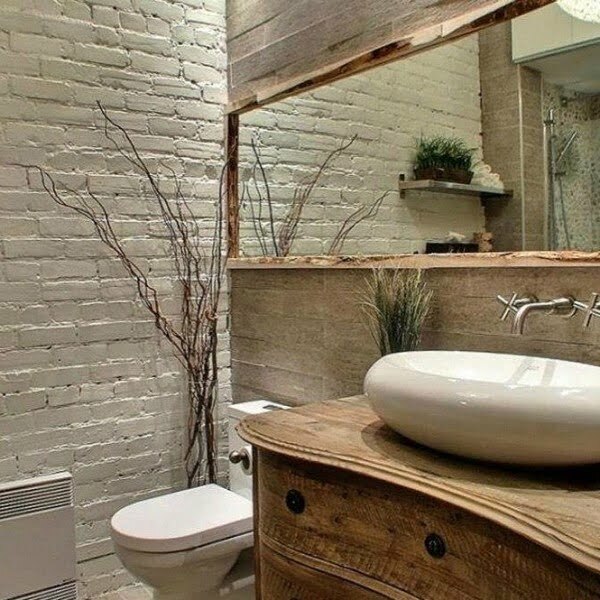 The bathroom offers a living-room-like vibe and concentrates on fashionable decor details, such as a collage wall mirror and retro rocking chair. 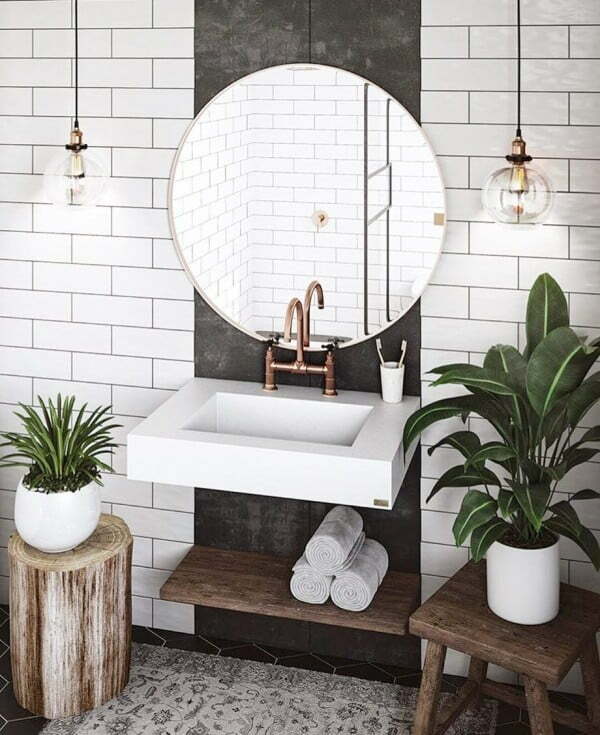 A white open bathroom space, which focuses on the statement wooden sink shelf and sizeable frameless mirror, enriched by nightstand wall lamps. With dark wood flooring and a Japanese-styled paravan shower walls, the bathroom oozes luxury and practicality at the same time. An almost hotel-like bathroom with double mirroring, hanging lights and broad glass shower, depicting comfort and usability all at once. Although narrow, the bathroom uses warm wooden sink counter and sizeable central window, thus introducing spaciousness and commodity. 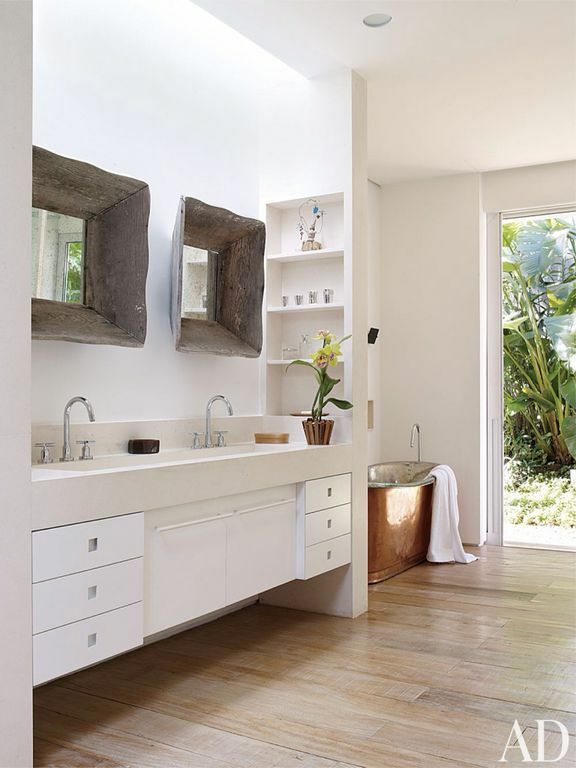 An excellent approach to a modern-day bathroom which uses a focal retro mirror, strategically reflecting the green and golden elements of the room. 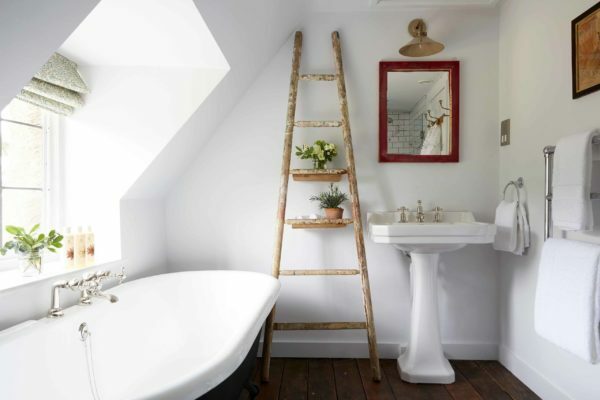 The vintage bathtub emphasizes the handmade wooden lamp and shifts attention to the rustic ladder flooring details. A thoughtful combination of white wooden walls and unadorned metallic details, complementing the non-traditional rearview-like mirror. 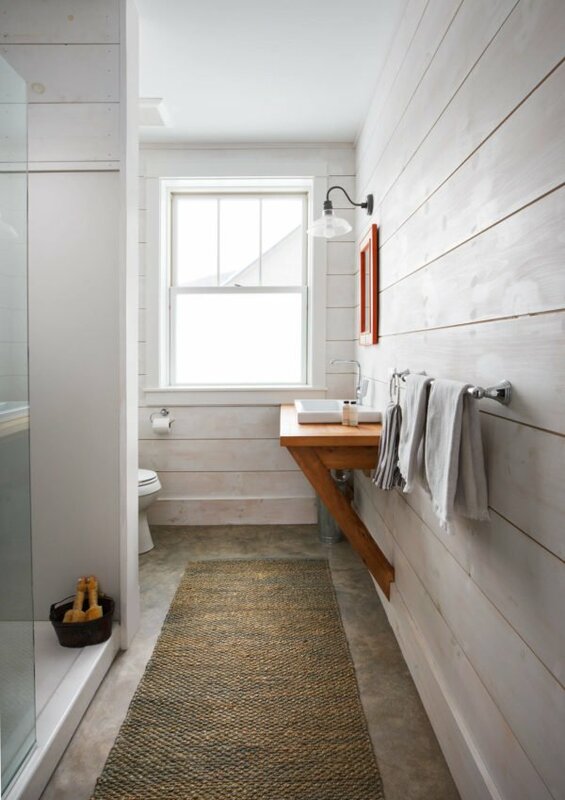 The diagonal wall offers plenty of light, while the wooden details of the bathroom scream tastefulness and a knack for design. 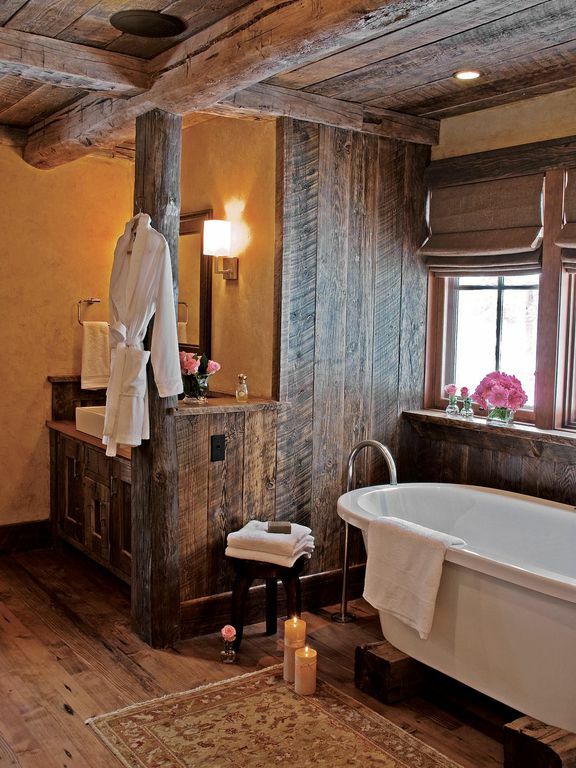 A fairy-tale approach to bathroom design, composed of a central, dark bathtub, and a reflecting renaissance wall mirror. 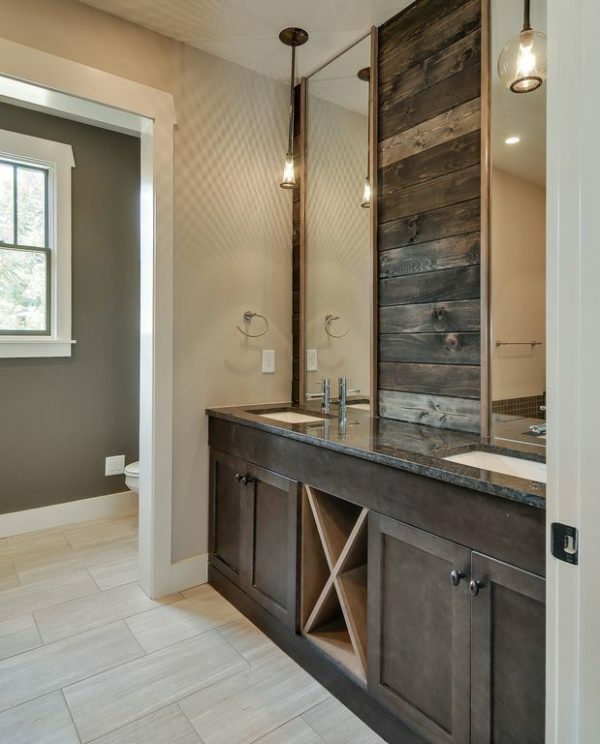 This is a correctly contemplated bathroom, using a wooden plank wall to separate the bathtub and incorporated sink. 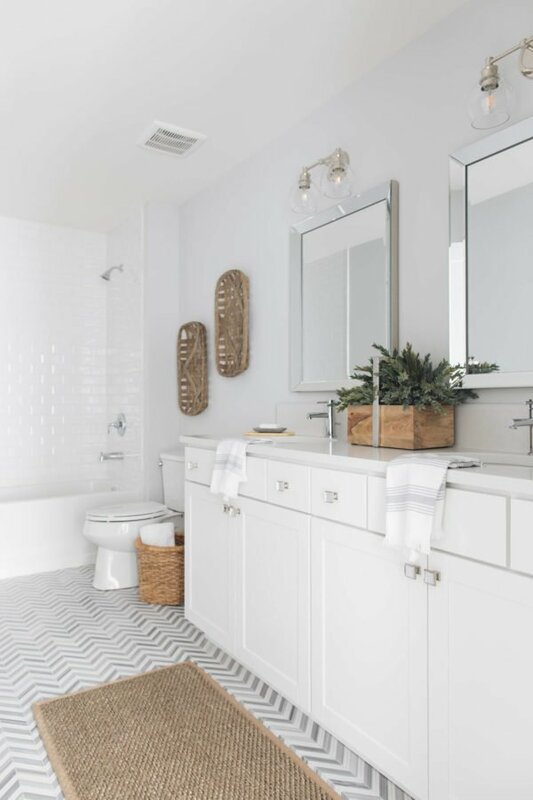 The patterned white-grey floor is a perfect match for the double-metal mirrors and extraordinary white cabinets. 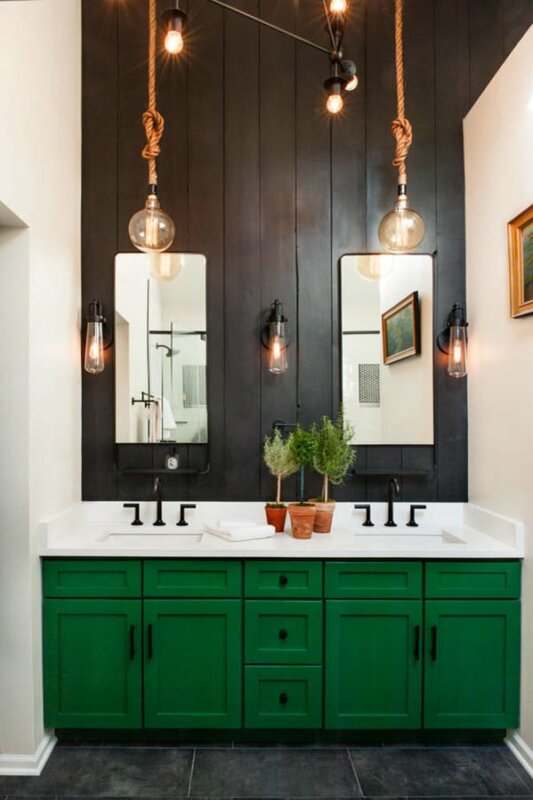 The bathroom introduces deep green cabinets and dark walls, which are ideally intertwined with the rustic, rope-inspired lighting set. 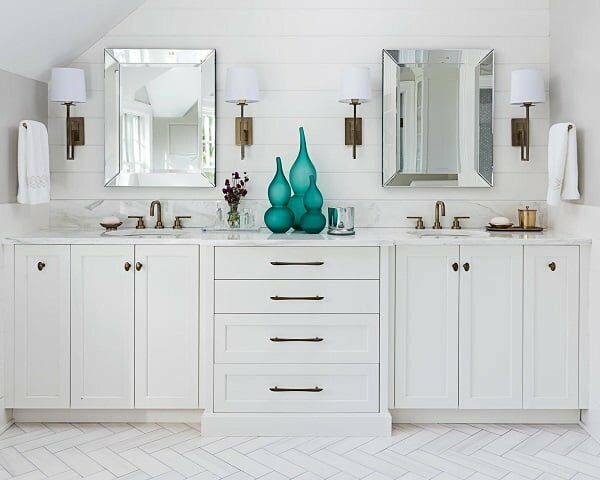 A smart bathroom tactic which uses opposite med cabinet mirrors which introduce light and space into the room, while focusing on the patterned, green wall and wooden nightstand. 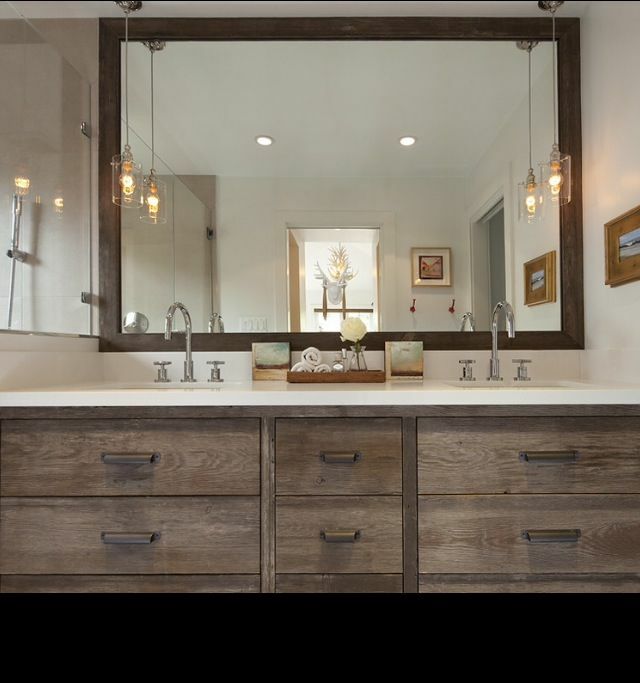 The attention-grabbing mirror offers an insight into this wooden cabinet bathroom with pale walls and phenomenal side lights. 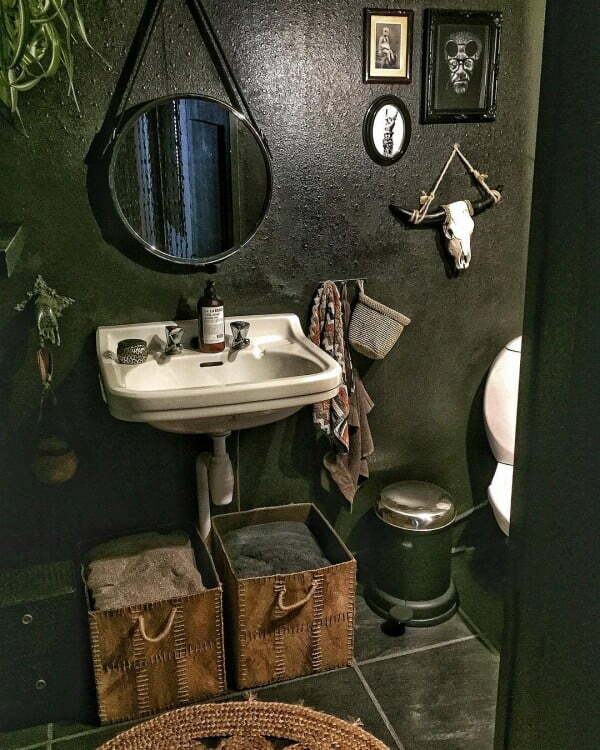 A darker take on a bathroom idea, using patterned wooden mirrors and country cabinet and tile-wall elements. 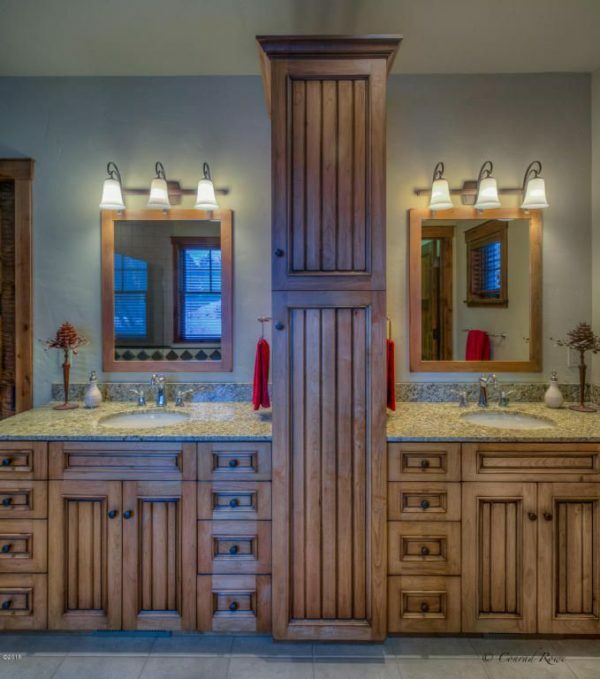 This second-story bathroom uses a diagonal wall to introduce light, and a majestic wooden cabinet set to offer storage space. 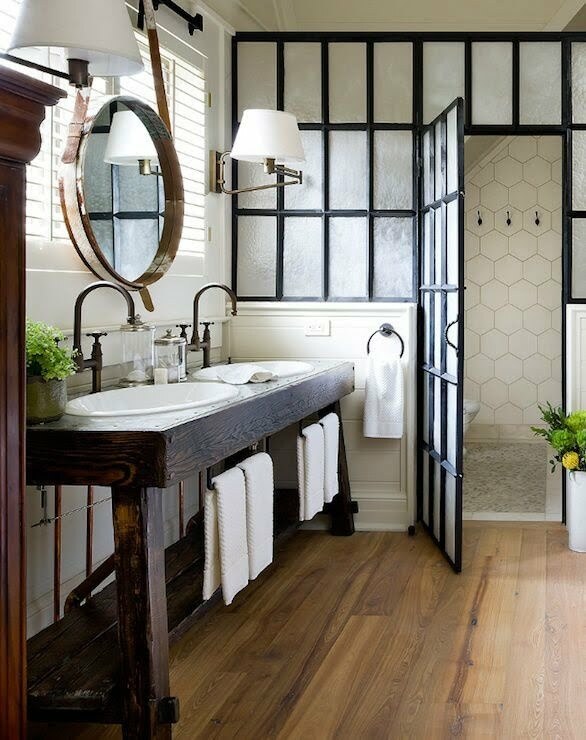 This bathroom uses a half-wall to separate the space in two while delivering plenty of light and dark-wood planks as a contrast. 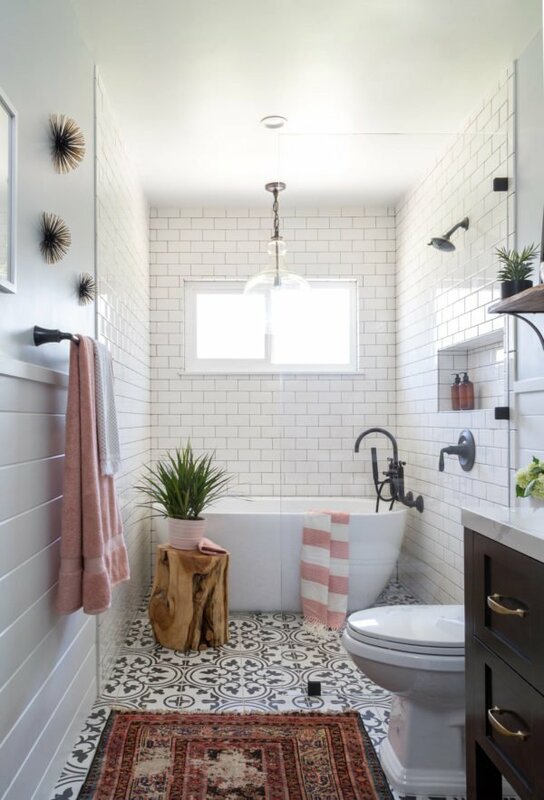 A great mix of patterns and materials, such as Turkish bath flooring and fancy white brick wall, accentuating the stand-alone bathtub. A beautiful bathroom with a dominant double mirror set and a hinged shower door, which combines the glass elements of the room to perfection. 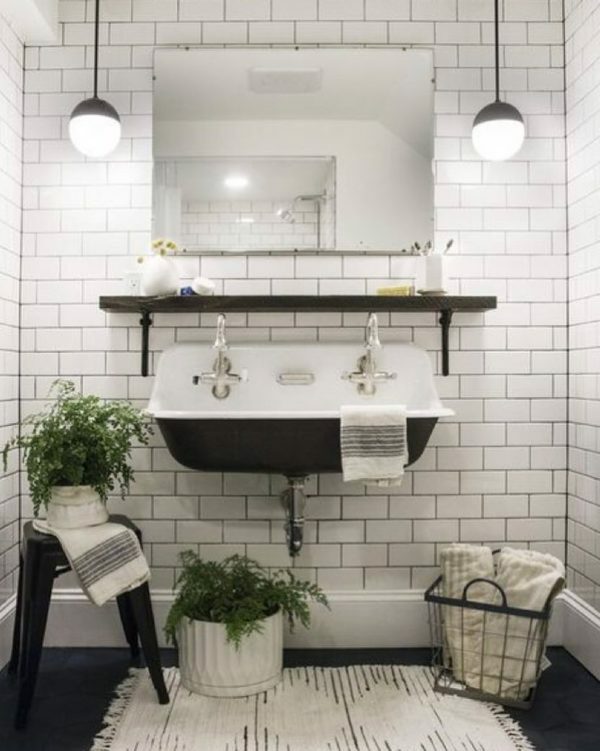 Simplicity is achieved through the white brick walls, double metal lamps and bright table-sink combination with extra storage space beneath it. 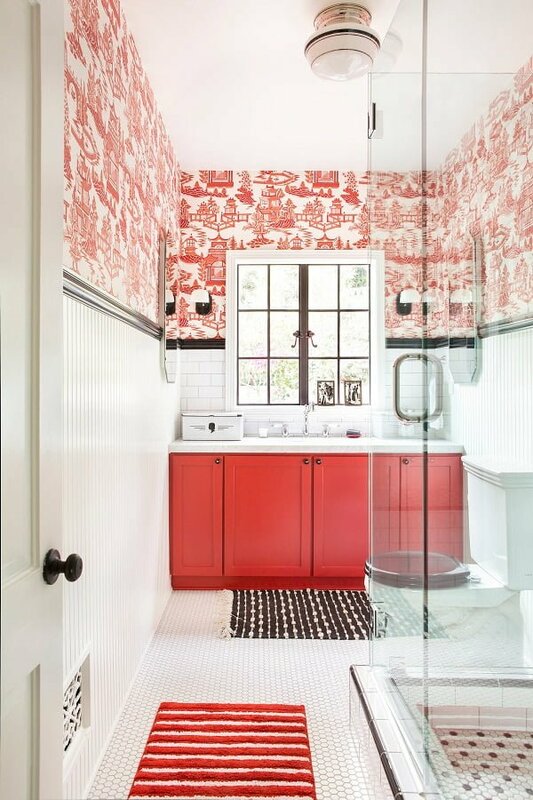 The red patterned wall stickers offer a Chinese vibe to the bathroom, balanced out with the central window placement and square, glass shower. 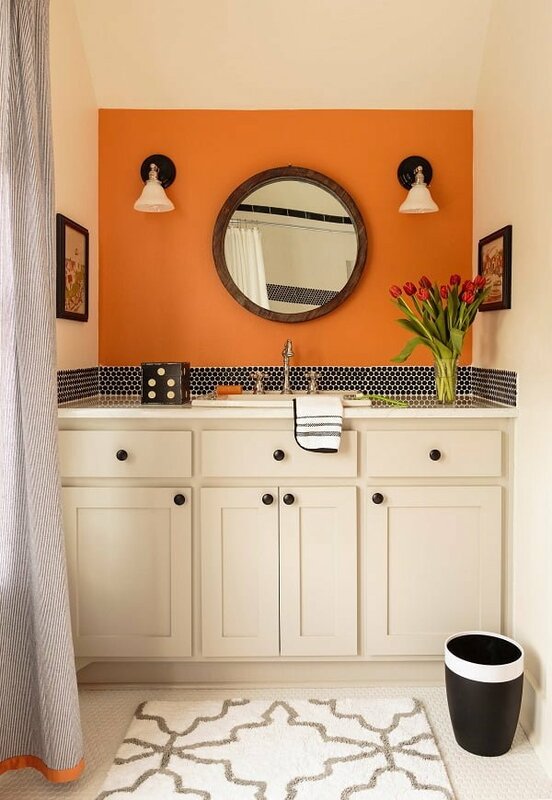 Instead of traditional white walls, this bathroom uses a vivid orange statement wall, an original lighting set and an extraordinary play of colors. 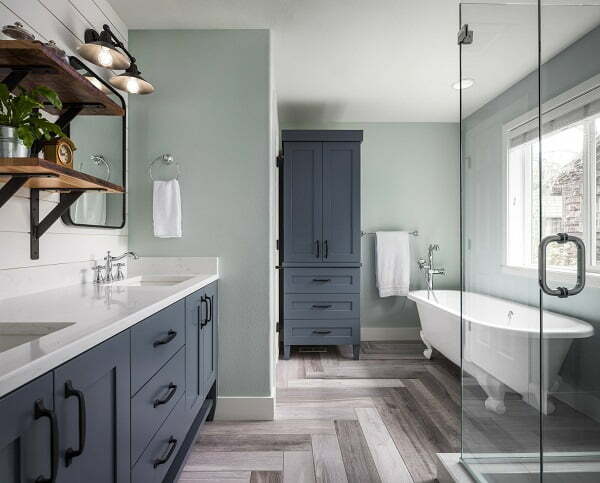 The bathroom is focused on wall-to-wall cabinets as well as a smart take on white-tile wall segments and hardwood flooring. 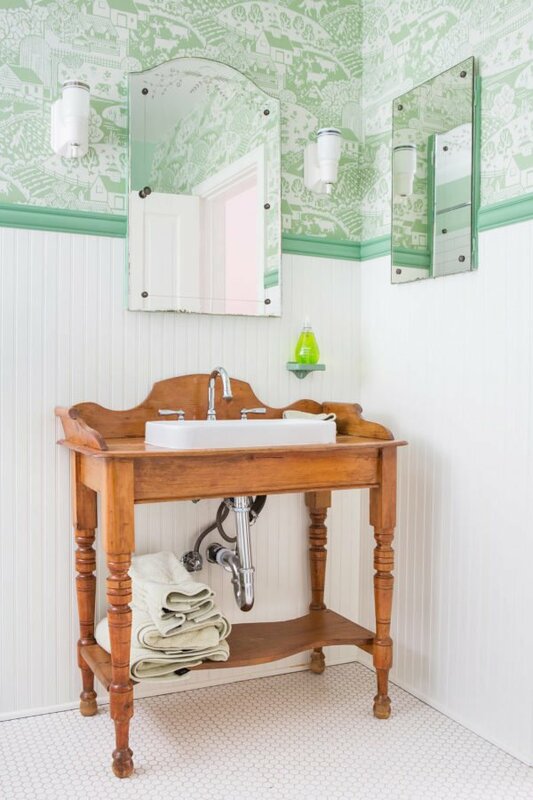 An Alice in Wonderland approach on a bathroom, using chess-inspired flooring, a sideway window, and original mirror placement. 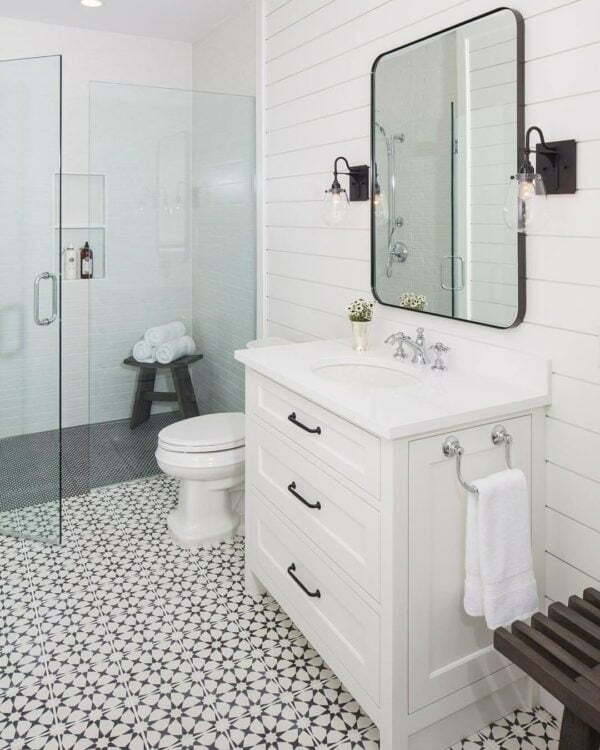 This majestic bathroom combines wooden walls and small tile shower walls while using original mirror replacement and a storage-friendly wooden sink stand. 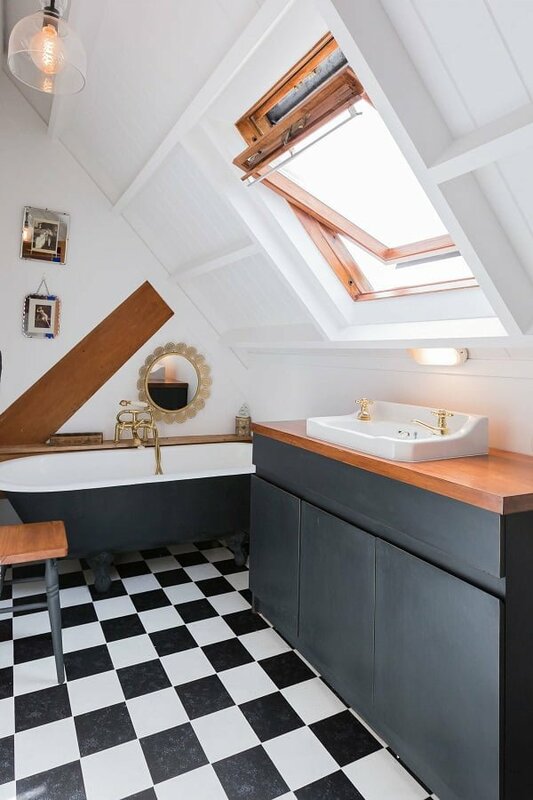 The bathroom has a vertical and luminous concept but provides excellent cabinet storage space, high wooden ceilings and a direct link to the rest of the house. 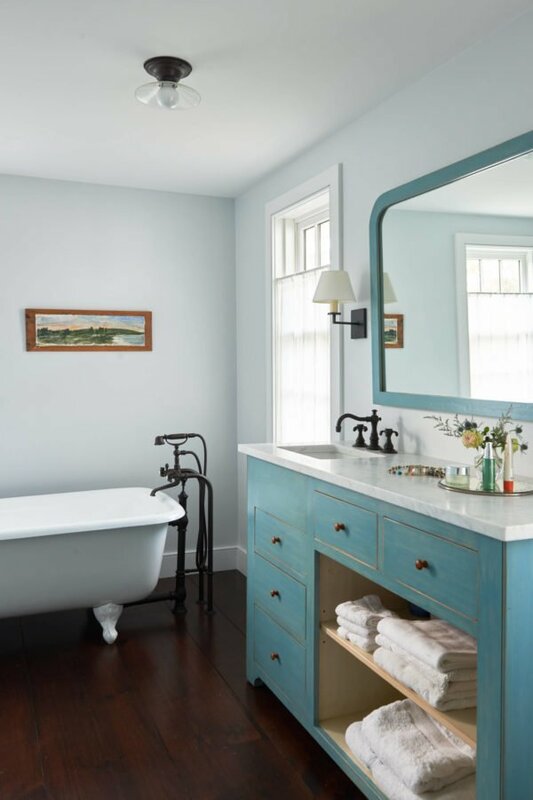 This master bathroom incorporates white walls and soft blue cabinet tones, which go hand in hand with the exposed metal bathtub tap and the focal mirror. A divine blend of textures, materials, and colors, with a particular emphasis on the sliding barn door and wooden floor. 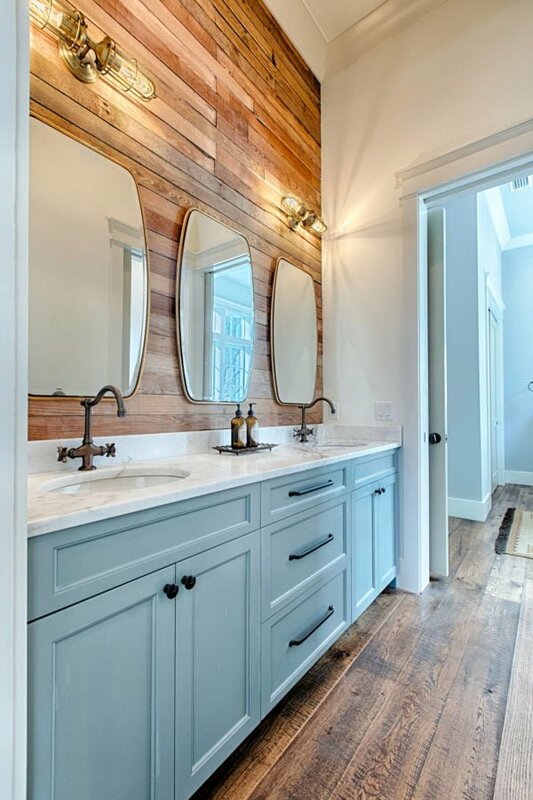 A great mix of timber-inspired wallpaper as well as mellow brown flooring and almost hobit-like sink. 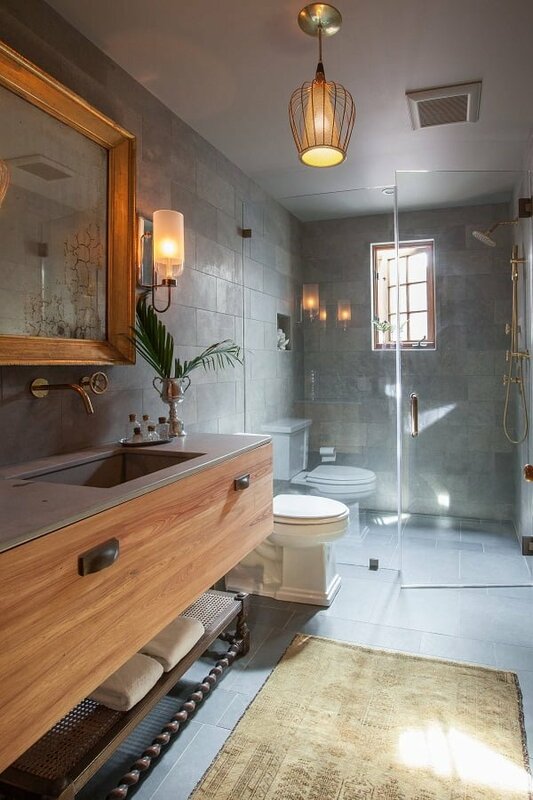 The bathroom uses modern-day lighting elements and blends them perfectly with the brown collage tile floor. 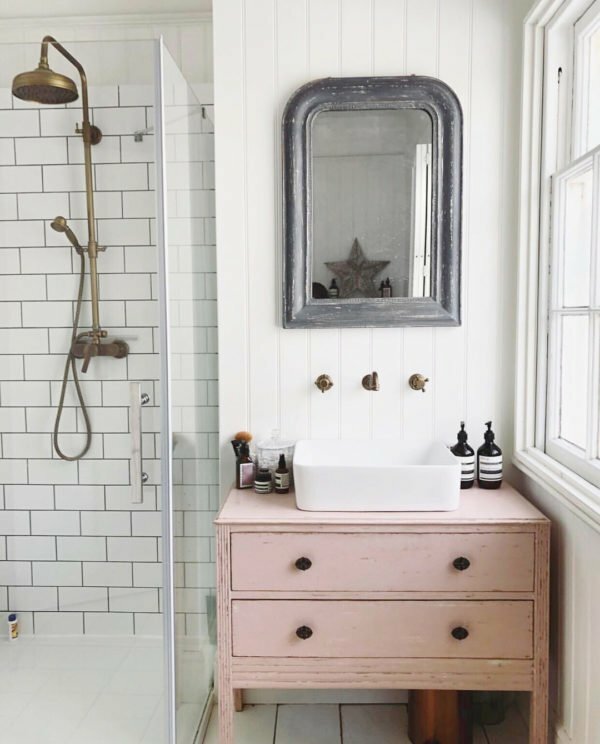 The bathroom introduces hints of baby pink shades in the shape of a rustic cabinet, complemented by a retro mirror and white tile walls. 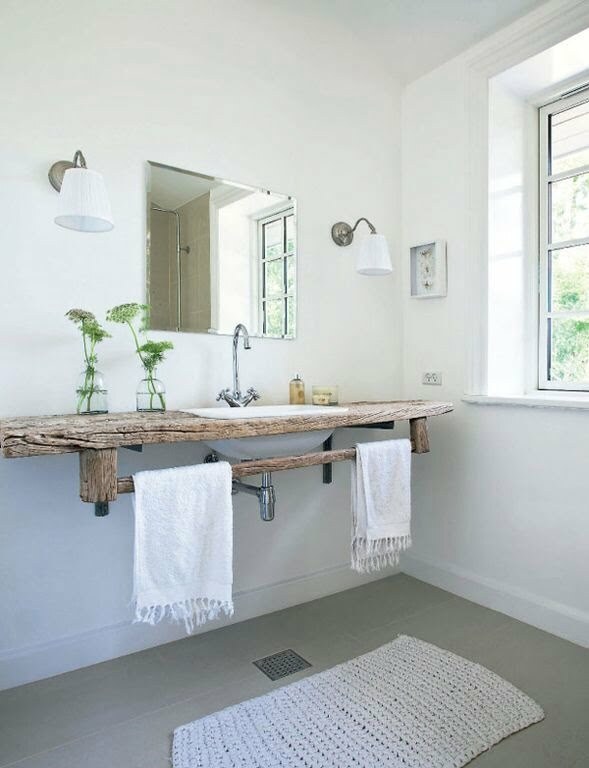 The stretching root wooden sink design combines marble and glass, creating a lovely synchronization with the metal table holder hook. 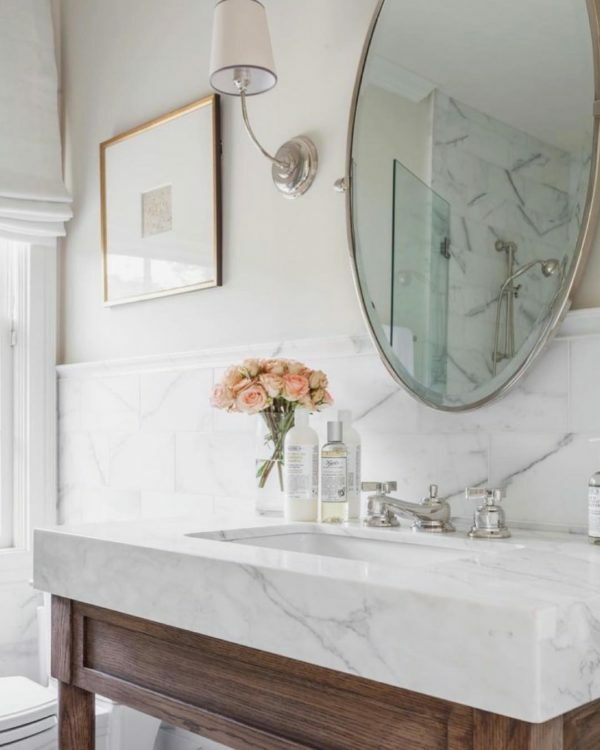 White-on-white bathroom designs never looked so good, from the multiple mirrors and sink elements to the zig-zag marble flooring. The wooden under-ceiling bar separates the bathroom, giving the practical bathtub and classic mirror set a chance to shine. 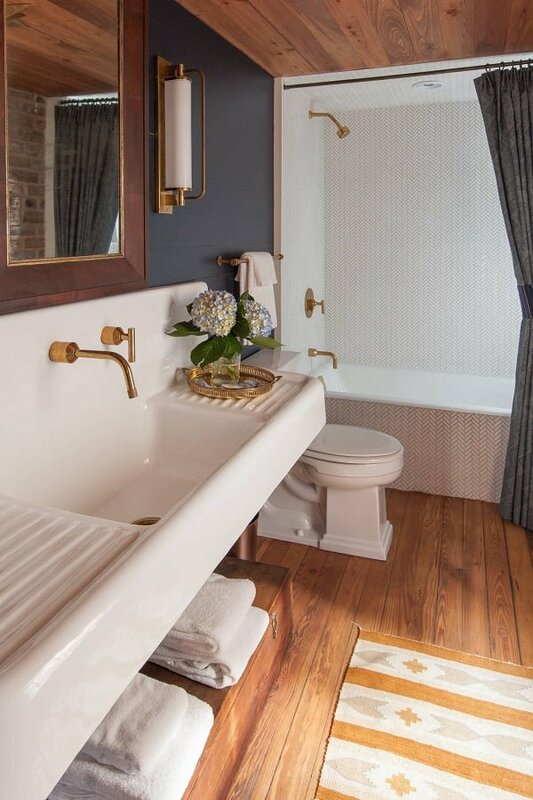 The bathroom uses both custom-made doors and internal wooden windows to create extra space and accentuate the retro brass bathtub. 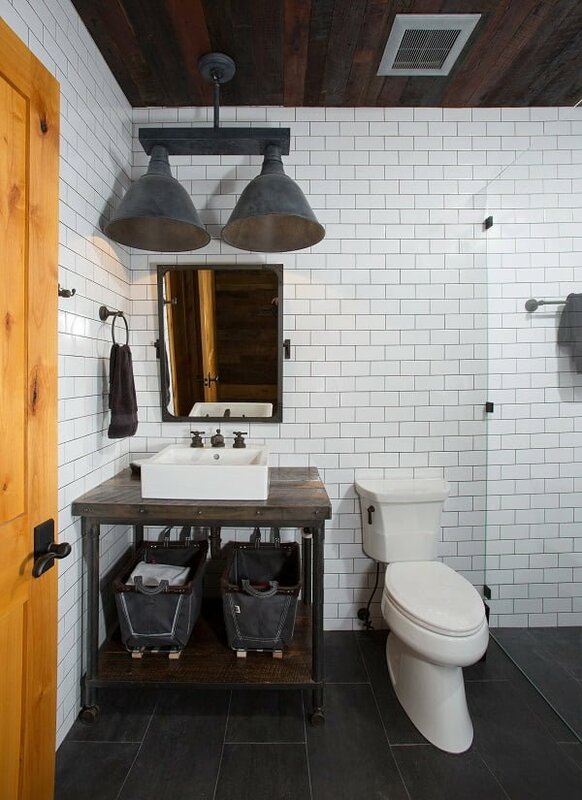 The setting consists of grey walls, mirror cabinets combo, a tub-like stone sink, and essential wooden decor. 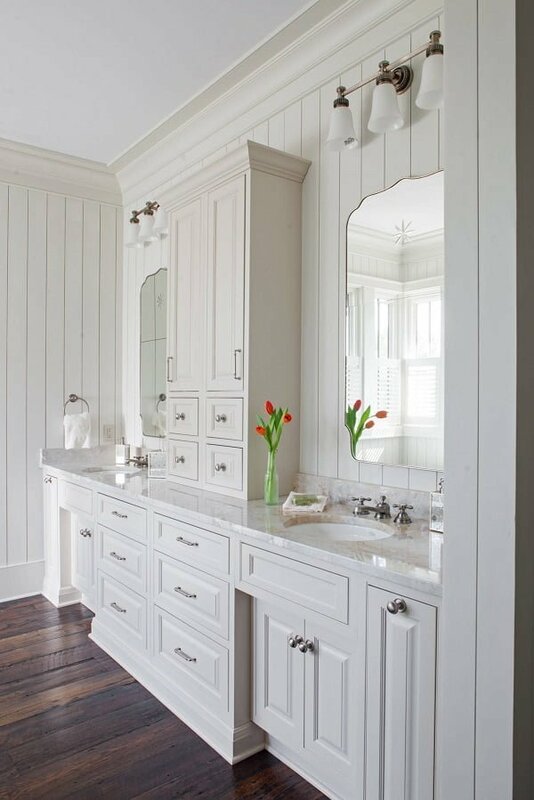 The bathroom is cleverly divided into two segments, using a floor-to-ceiling wooden cabinet and adorable marble details. 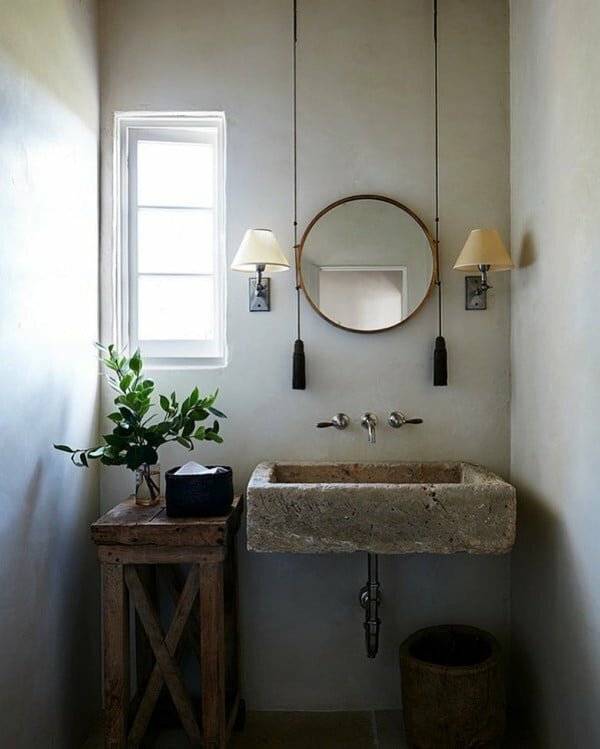 The bathroom setting revolves around the statement stone basin, incorporated into a custom-made hardwood cabinet overlooking the countryside. 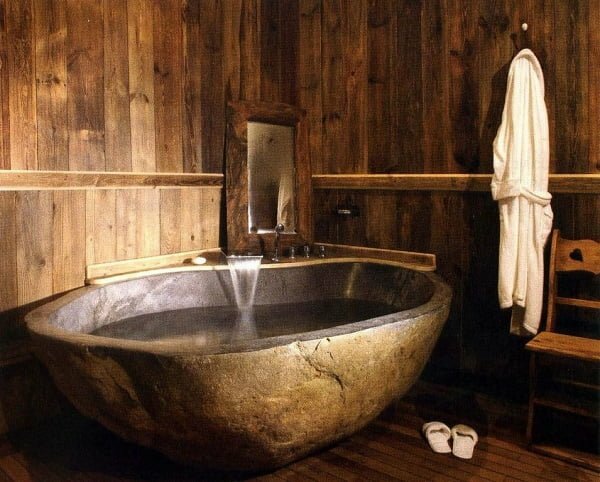 The bathroom introduces a sauna-inspired design, with a dominant stone bathtub and wood plank walls and ornaments. 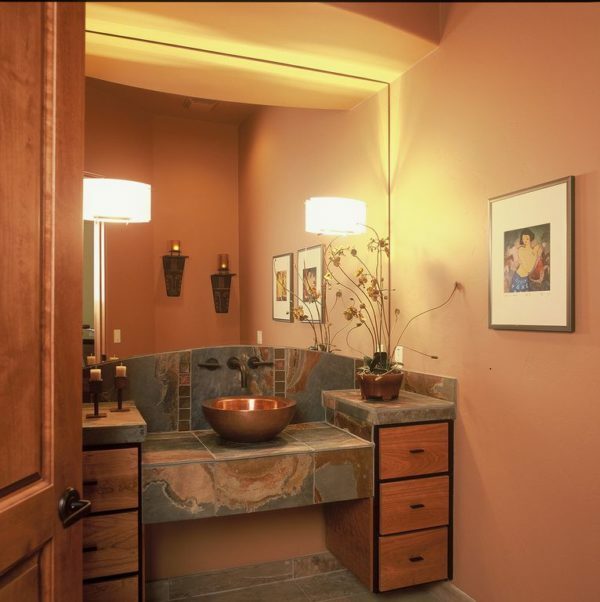 The warm combination of brown shades and stone countertop reveals the effective brass sink and asymmetrical V-walls. 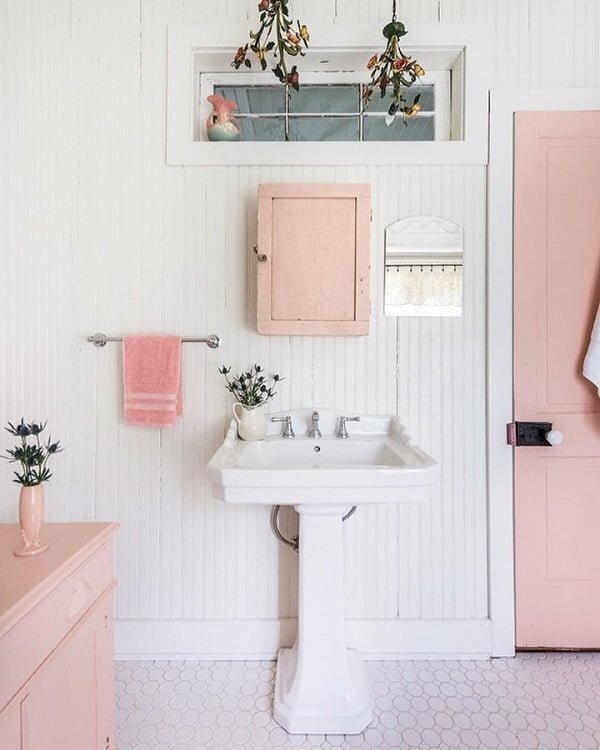 A room designed with grandma-inspired bathroom vibes, decorated with pink half-walls and traditional sink and curtains. 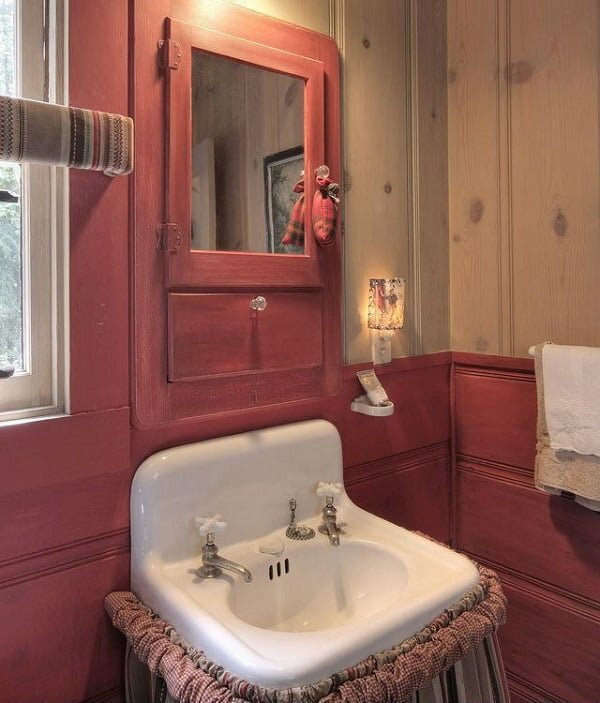 Precious bathroom using white wood planks walls and a classic middle-height sink, boosted by plenty of embellishing rose bits. The white walls are broken up by cleverly positioned lights which throw shadows over the rustic nightstand-inspired table and white wooden hanger. A great balance between the modern outer window and tiny wood shelves, creating an expertly designed space that works. 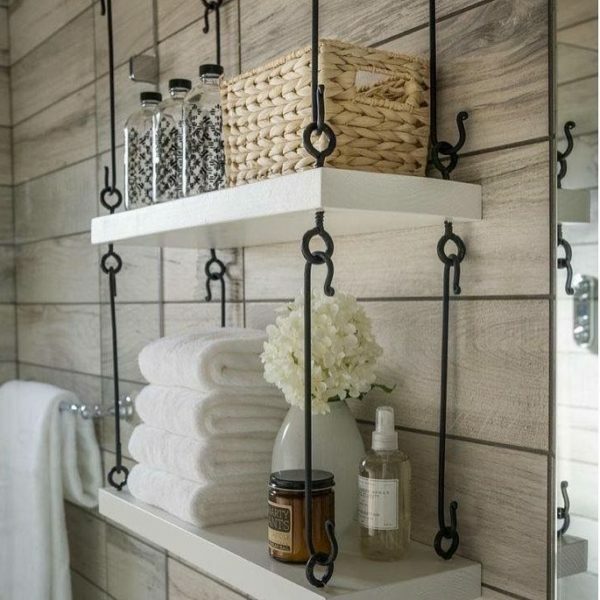 The wired glass bottle goes hand in hand with the remaining bathroom shelf detail, including the floral setting and white plank walls. Have a look at the brilliant wired ‘Towel’ hanger! 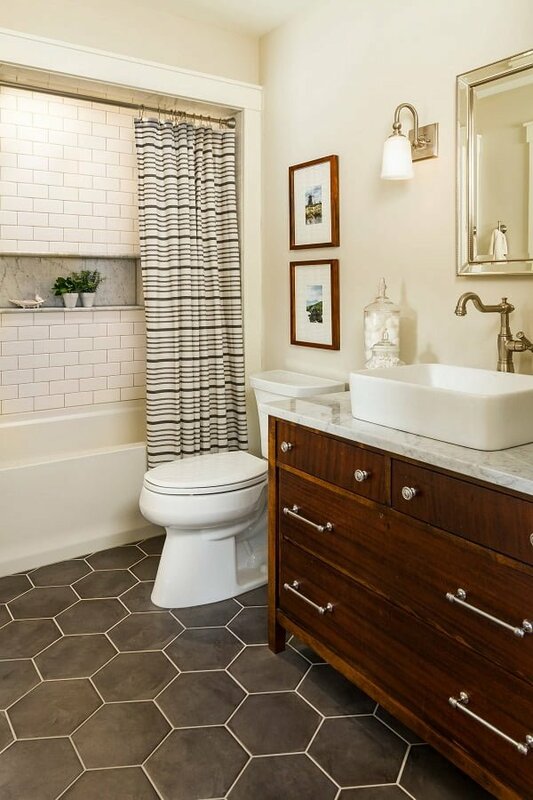 This bathroom incorporates zesty details such as the stool stand and matte ivory curtains! 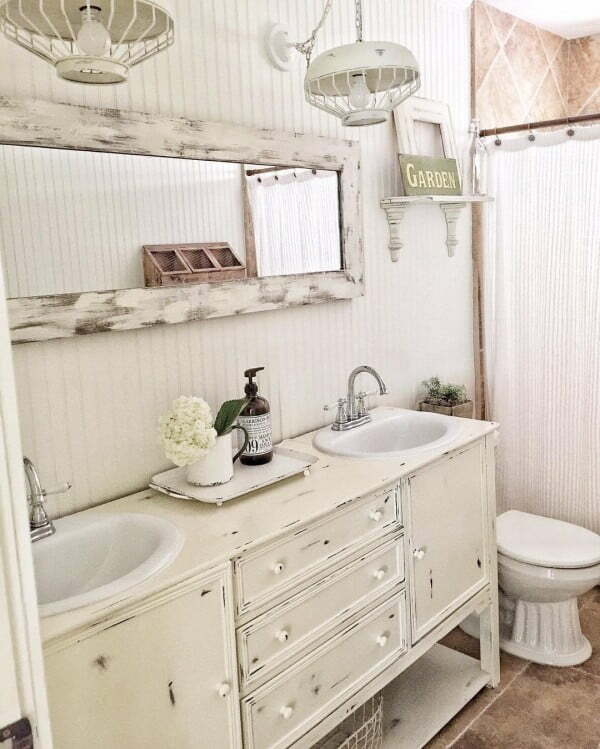 The creamy and cappuccino wall paint is elevated with tin-decorated mirror and precious bookshelf. 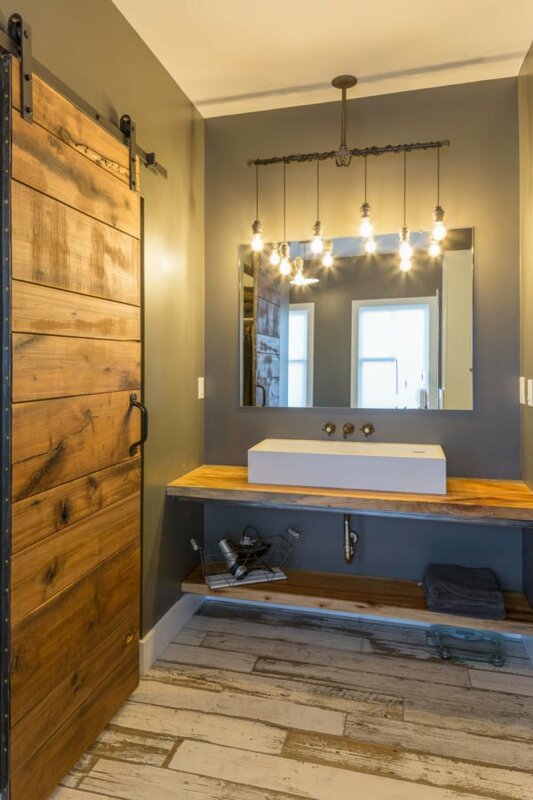 The bathroom lights deliver almost dressing room vibes, while the framed rustic mirror reflects the private bathtub and cabinet. 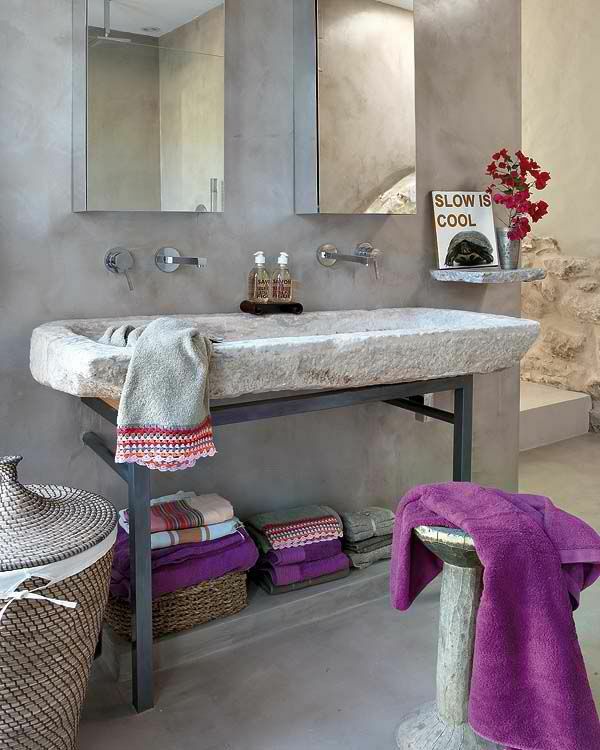 The bathroom echoes a rustic feel due to the freestanding tub, refreshing glass cabinet and fancy inbuilt shelves. 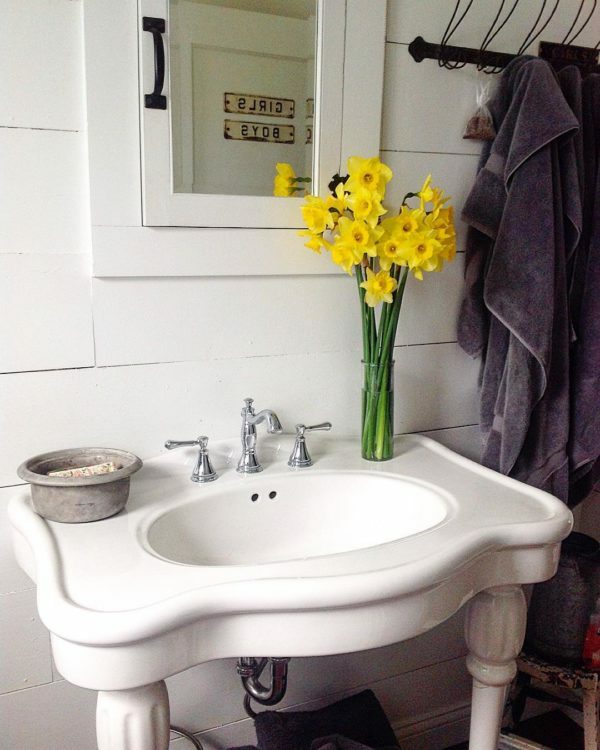 An epic take on bright yellow daffodils vase which breaks the neutral walls and medical cabinet mirror color patterns. 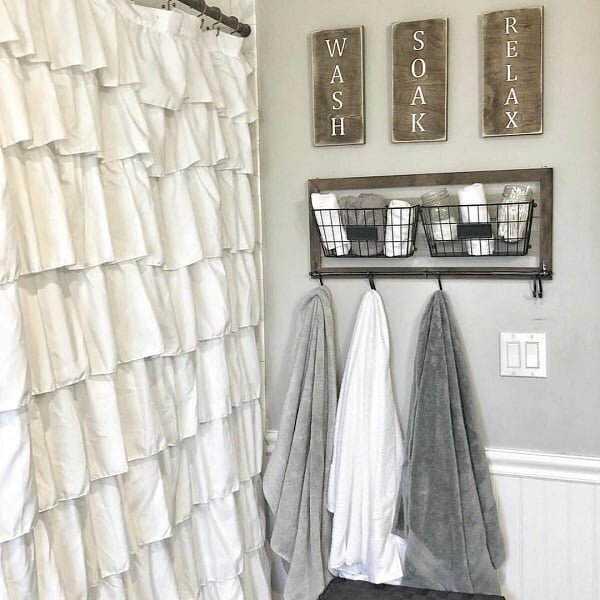 The beautiful ruffle-layered curtains give the bathroom a flirty feel, alongside the wood-engraved signs and framed hanger. 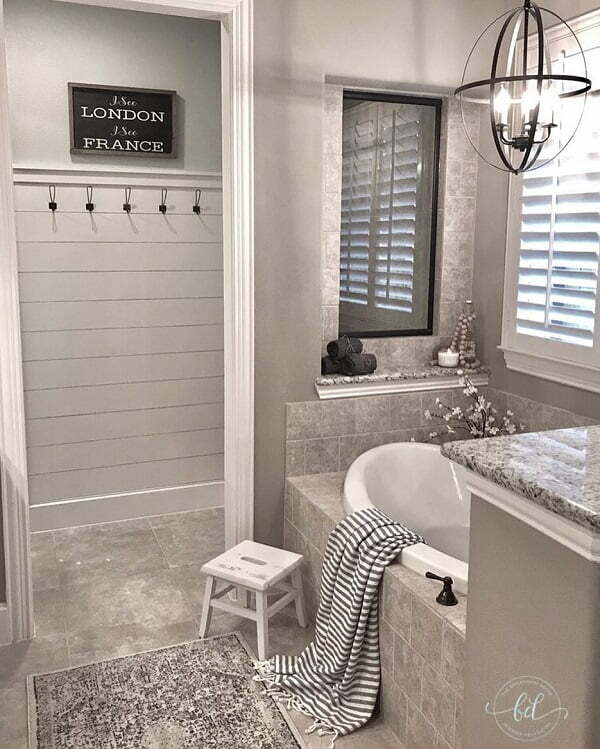 The in-built bathtub steals all the attention, while the grey tile and marble play of the room give it an elegant feel. 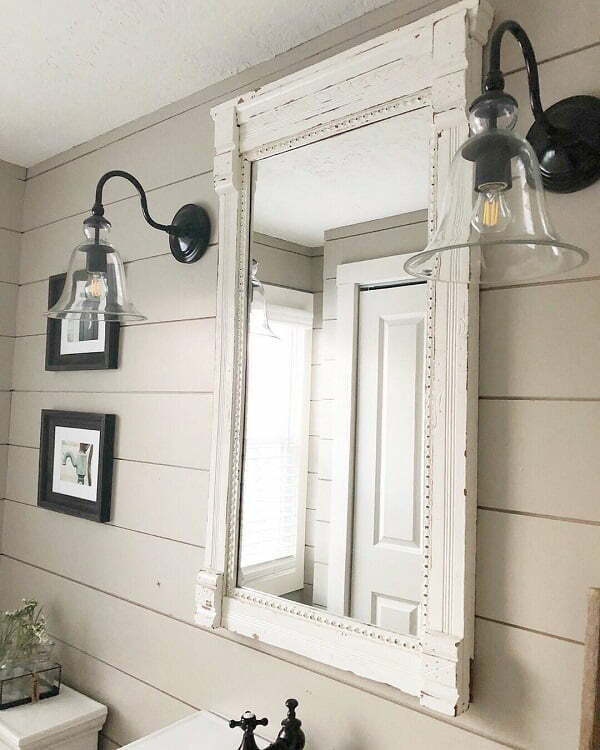 The statement piece of this set is the rustic white wood mirror, enlightened by trendy glass lamps hanged on the white plank wall. 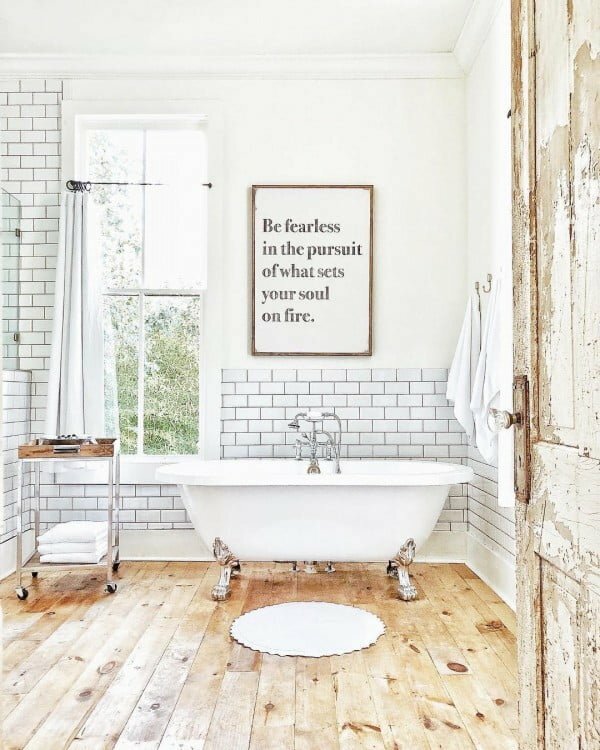 Clean, captivating and cozy, the bathroom uses smart details such as retro quote frames, wooden shelves, and glass storage jars, depicting a rustic utopia. 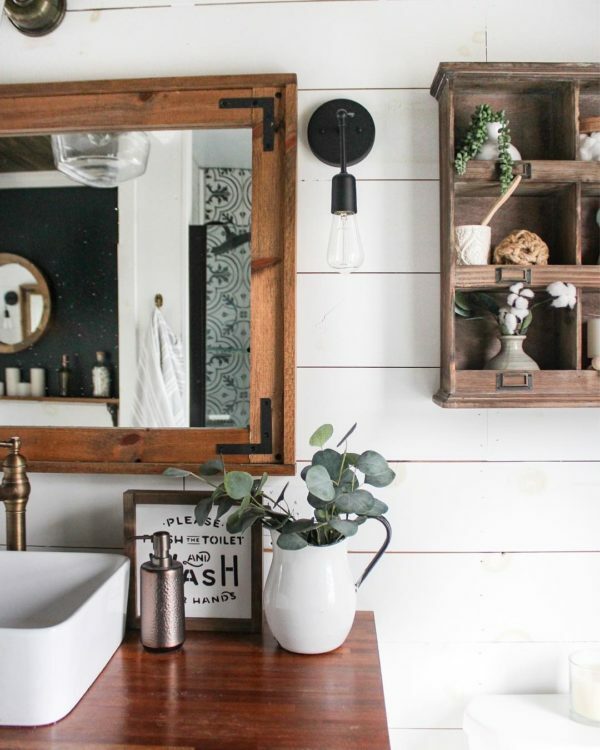 Darker shelves shades give this bathroom an elegant vibe, softened by simple, yet effective decor elements, such as the aromatic candles and old-time fan. 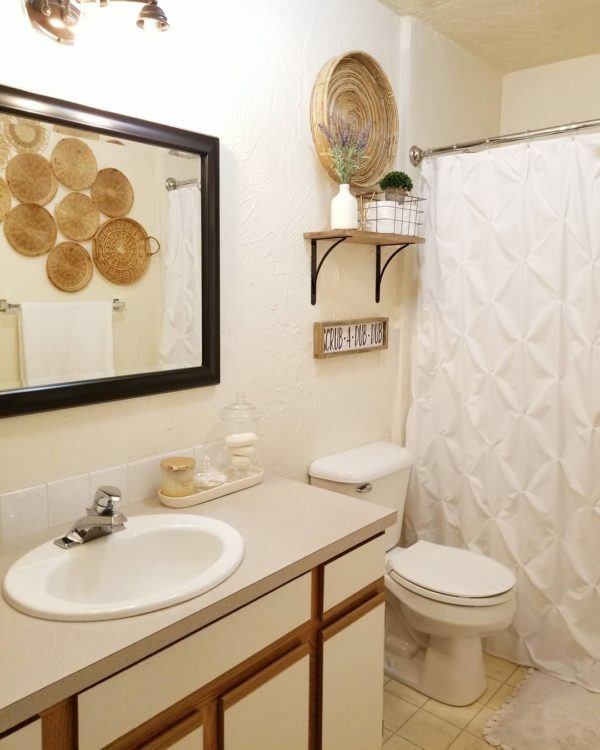 A precious bathroom setting focused on combining oriental tile flooring, a wood park bench and hinged shower door, which helps open up space even further. 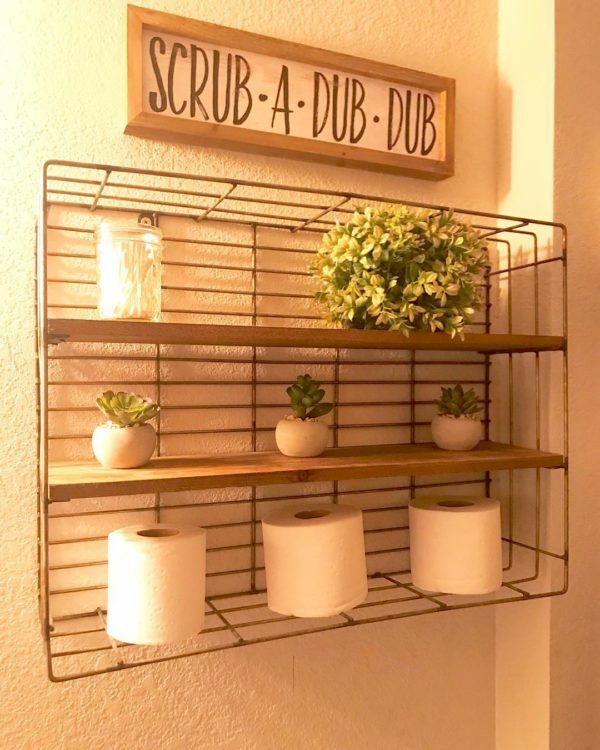 The wired storage wall rack incorporates wooden shelves which are a great addition to the retro custom-made quote sign. 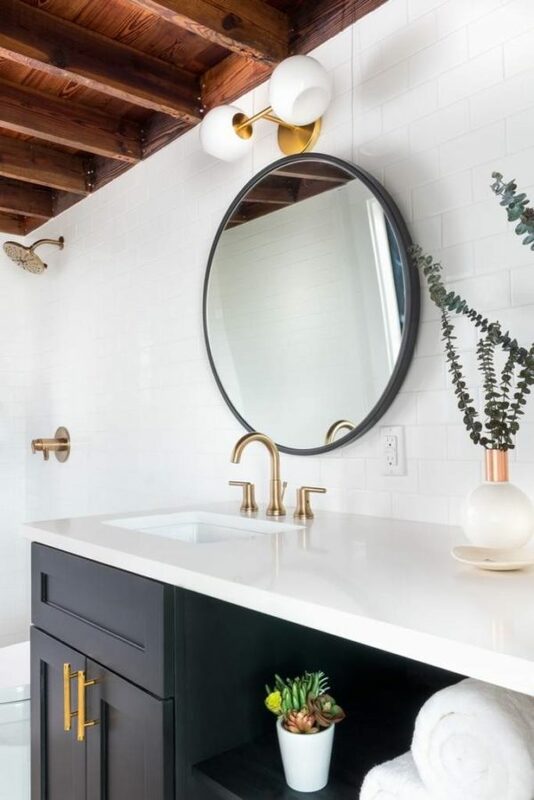 Combining a vintage marble sink countertop, and frameless mirror, the bathroom offers plenty of light and cheerful elements of hardwood. 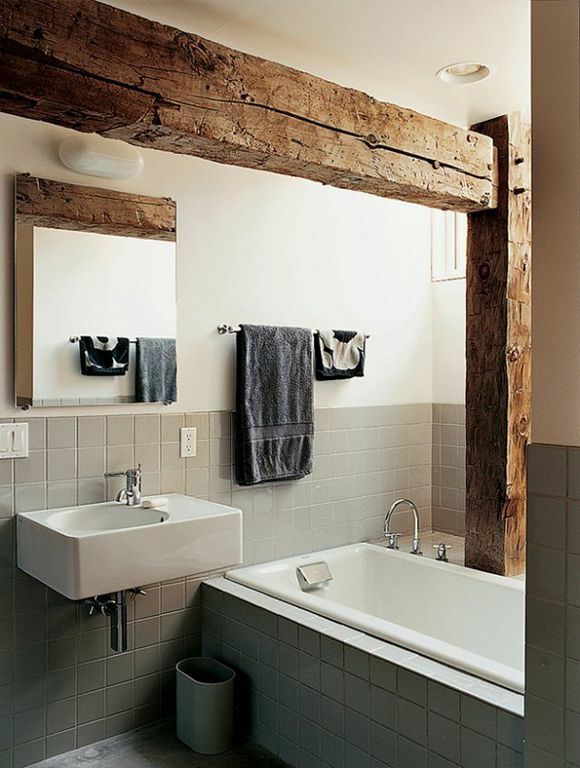 The rearview-like mirror hanging on a rope gives the bathroom a rustic essence while playing around with the crisp white sink and walls of the room. 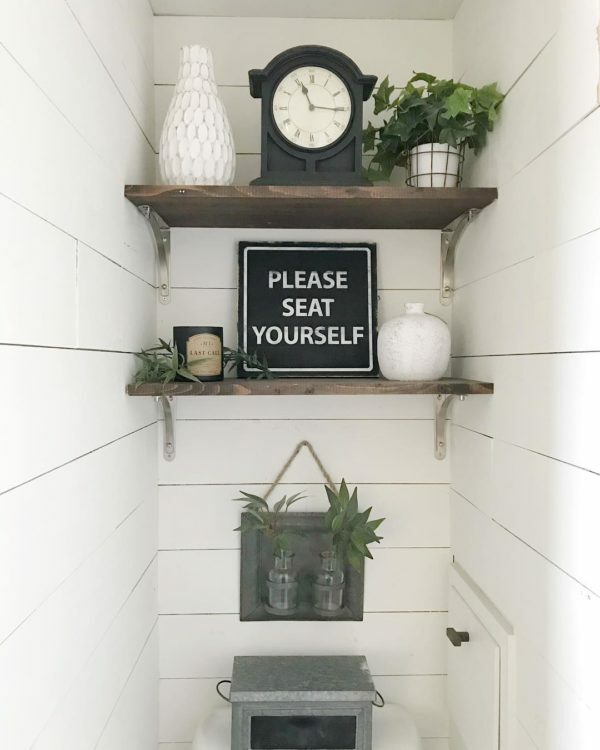 The wood-imitating tile floor is an ideal addition to the rustic wooden cabinet, brick tile wall, and retro bath sign. 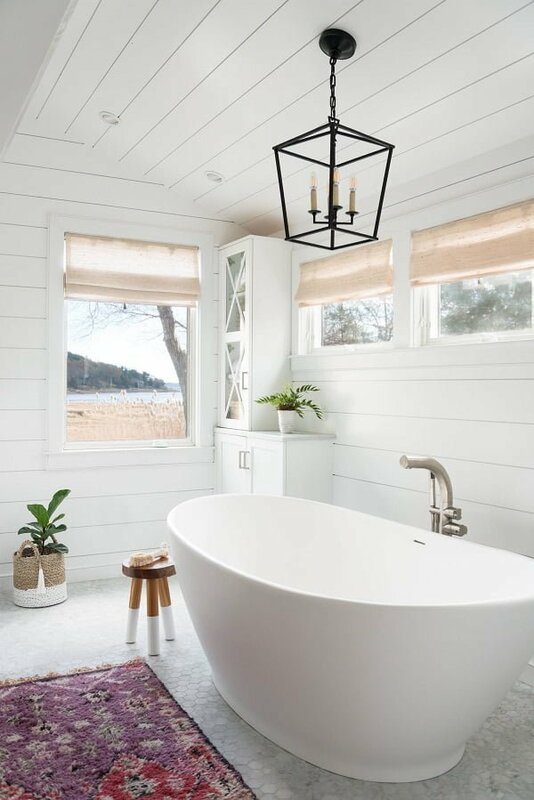 The deep, porcelain tub is strategically placed beneath a full window, illuminating the wood-metal shelf set. A clever combination of wooden decorative shelf box and retro mirror, emphasized by simple lighting elements and exposed porcelain basin. 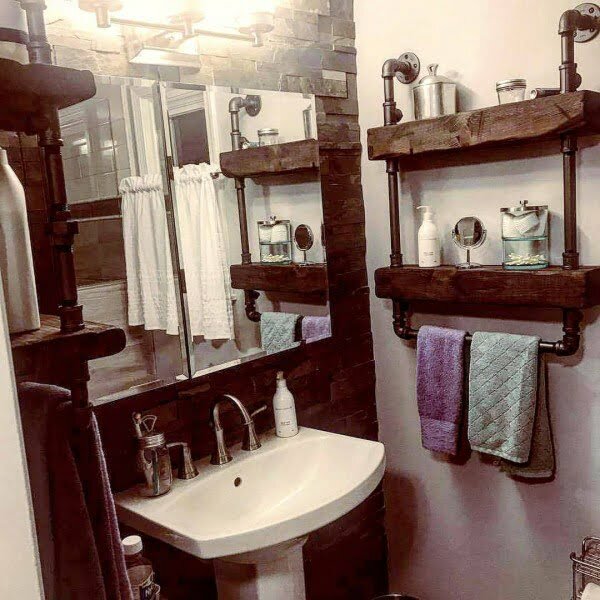 The bathroom setting is enhanced by the ivory tile walls, and Victorian hook-connected, spacious wooden shelves. 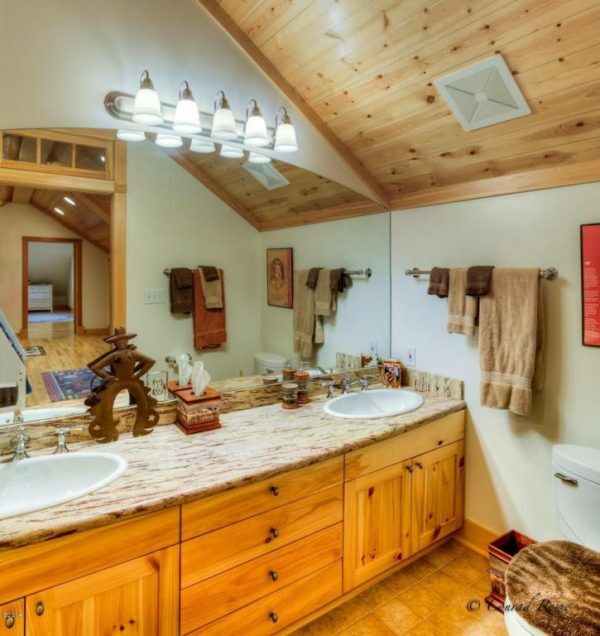 This bathroom offers plenty of comfort through its hardwood walls, and built-in wooden shelf set. Functional and adorable! 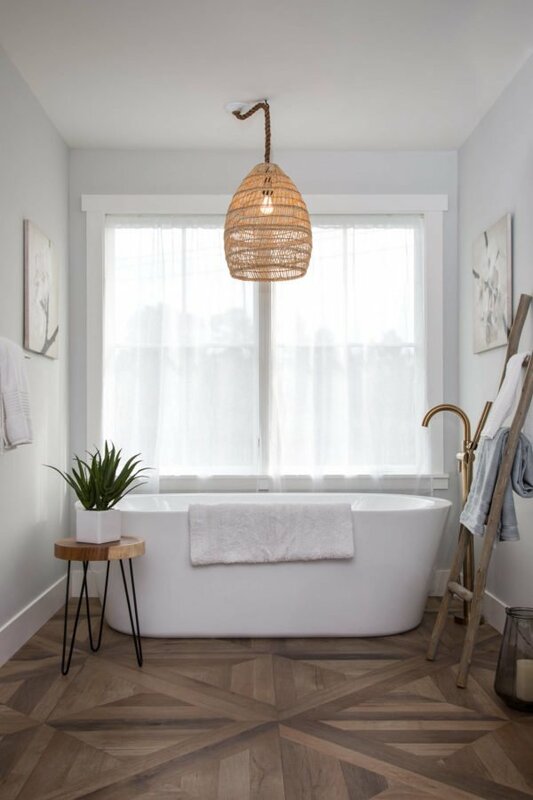 The white ruffled shower curtains introduce light into the room, supported through the wooden and doorless bath cabinet as well as plank wood flooring. 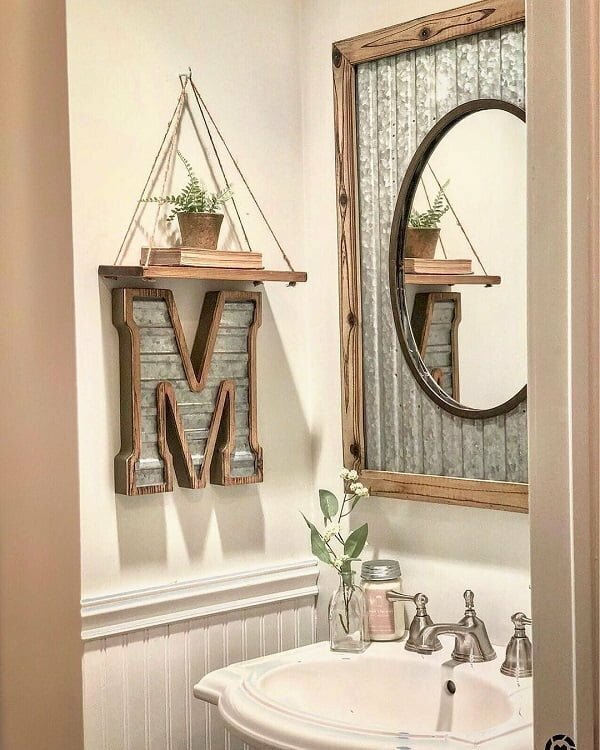 The bathroom intertwines ruffled shower curtains which match well with the old-school tin shelf and exciting wood bath sign. 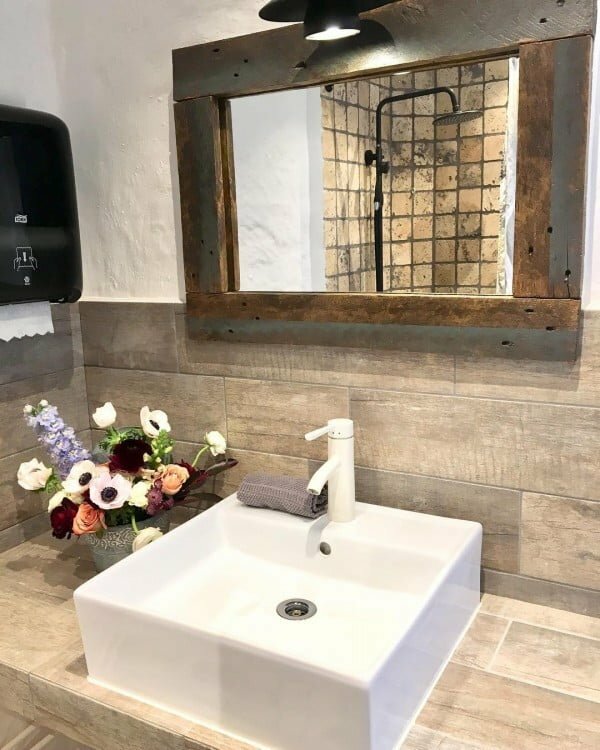 A smart approach on small bathrooms, using the rustic framed mirror to introduce light and simplified porcelain sink with single metal faucet. The double-mirror and sink setting enable practicality and comfort, enhanced by a non-traditional bathroom cabinet. 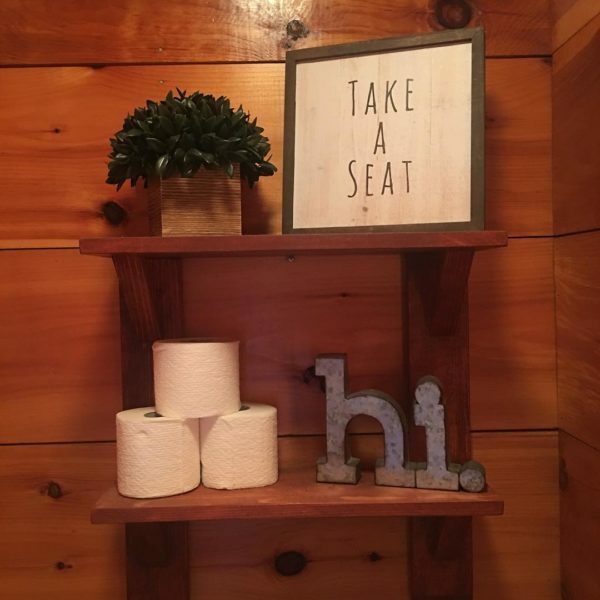 A typical countryside bathroom setting, playing with ornamental baskets and miniature wooden decor shelves as well as vibrant bathroom signs. 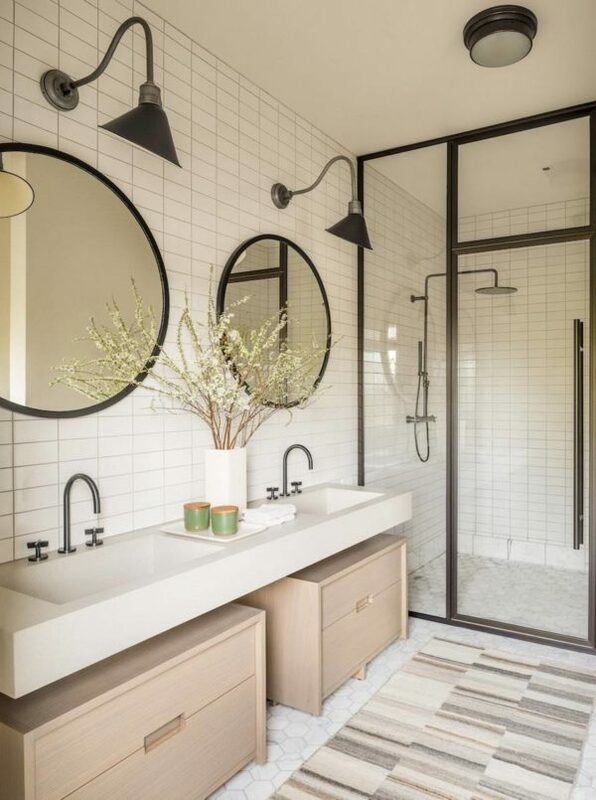 The bathroom design brilliantly focuses on the three-mirror wall collage, deep double faucet sink, and wooden bathroom shelf, thus providing plenty of room and light. 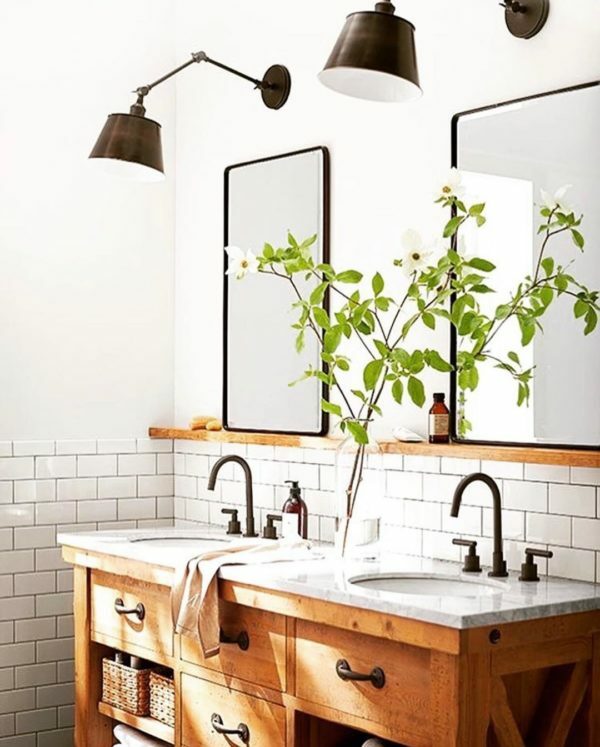 The stylish hanging lamps emphasize the rustic double-tap basin, minimalistic mirror, and tile brick walls. 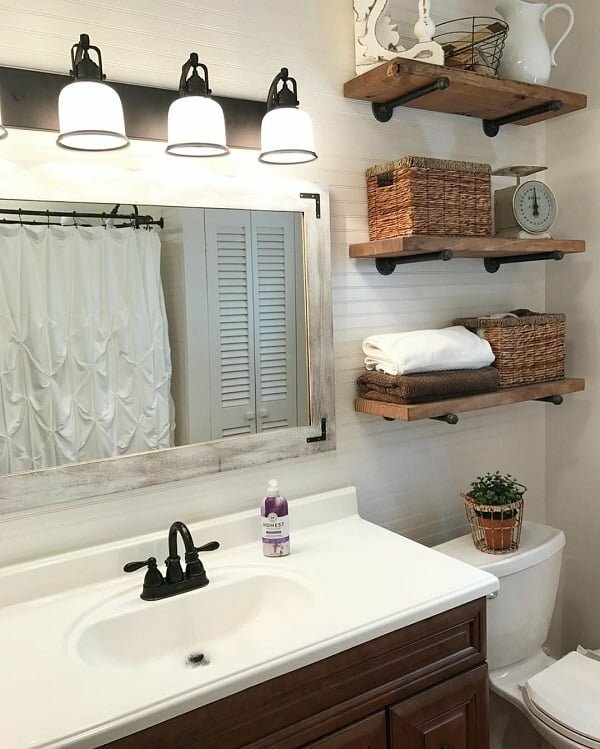 A great example of how to create a small-sized bathroom nook, enhanced with over-the-toilet wooden shelves and photo-frame rustic mirror. 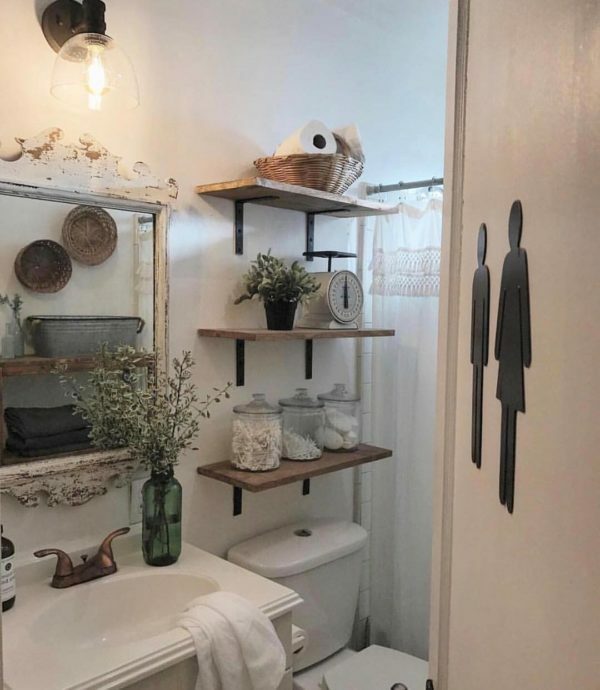 A tiny-spaced setting is focusing on a practical toilet, surrounded by all-white walls and bathroom sign decor.